Chronic obstructive pulmonary disease is a leading cause of death and disability, but has only recently been extensively explored from a cellular and molecular perspective. There is a chronic inflammation that leads to fixed narrowing of small airways and alveolar wall destruction (emphysema). This is characterised by increased numbers of alveolar macrophages, neutrophils and cytotoxic T‐lymphocytes, and the release of multiple inflammatory mediators (lipids, chemokines, cytokines, growth factors). A high level of oxidative stress may amplify this inflammation. There is also increased elastolysis and evidence for involvement of several elastolytic enzymes, including serine proteases, cathepsins and matrix metalloproteinases. The inflammation and proteolysis in chronic obstructive pulmonary disease is an amplification of the normal inflammatory response to cigarette smoke. This inflammation, in marked contrast to asthma, appears to be resistant to corticosteroids, prompting a search for novel anti-inflammatory therapies that may prevent the relentless progression of the disease. The meeting “COPD: the important questions” held in Malta in November 2002 was sponsored by AstraZeneca. This review is a summary of a meeting on “COPD: the important questions” held in Malta in November 2002. The aim of the meeting was to identify important questions related to the cellular and molecular mechanism involved in chronic obstructive pulmonary disease (COPD) and to discuss new research approaches to gain a better understanding of the basic mechanisms involved in COPD. COPD is a major and increasing global health problem, which is predicted to become the third commonest cause of death and the fifth commonest cause of disability in the world by 2020 1. While there have been major advances in the understanding and management of asthma, COPD has been relatively neglected and there are no current therapies that reduce the inevitable progression of this disease. However, because of the enormous burden of disease and escalating healthcare costs, there is now renewed interest in the underlying cellular and molecular mechanisms 2 and a search for new therapies 3, resulting in a re-evaluation of the disease 4. Despite its enormous global importance, there has been relatively little research into COPD and it is the most underfunded disease in relation to the global burden of disease 5. COPD is characterised by slowly progressive development of airflow limitation that is poorly reversible, in sharp contrast to asthma where there is variable airflow obstruction that is usually reversible spontaneously or with treatment. A new definition of COPD has recently been adopted by the Global Initiative on Obstructive Lung Disease (GOLD): “a disease state characterized by airflow limitation that is not fully reversible. The airflow limitation is usually progressive and associated with an abnormal inflammatory response of the lungs to noxious particles and gases” 6. For the first time this definition encompasses the idea that COPD is a chronic inflammatory disease and much of the recent research has focused on the nature of this inflammatory response. COPD includes chronic obstructive bronchiolitis with fibrosis and obstruction of small airways, and emphysema with enlargement of airspaces and destruction of lung parenchyma, loss of lung elasticity and closure of small airways. Chronic bronchitis, by contrast, is defined by a productive cough of >3 months duration for more than two successive years; this reflects mucous hypersecretion and is not necessarily associated with airflow limitation. Most patients with COPD have all three pathological mechanisms (chronic obstructive bronchiolitis, emphysema and mucus plugging) as all are induced by smoking, but may differ in the proportion of emphysema and obstructive bronchiolitis 2. In developed countries cigarette smoking is by far the commonest cause of COPD accounting for >95% of cases, but there are several other risk factors, including air pollution (particularly indoor air pollution from burning fuels), poor diet, and occupational exposure. COPD is characterised by acceleration in the normal decline of lung function seen with age. The slowly progressive airflow limitation leads to disability and premature death and is quite different from the variable airway obstruction and symptoms in asthma, which rarely progress in severity. While COPD and asthma both involve inflammation in the respiratory tract there are marked differences in the nature of the inflammatory process, with differences in inflammatory cells, mediators, response to inflammation, anatomical distribution and response to anti-inflammatory therapy 4, 7. Some patients appear to share the characteristics of COPD and asthma, however. Rather than this representing a graded spectrum of disease, it is more likely that these patients have both of these common diseases at the same time. Histopathological studies of COPD show a predominant involvement of peripheral airways (bronchioles) and lung parenchyma, whereas asthma involves inflammation in all airways but usually without involvement of the lung parenchyma 8. There is obstruction of bronchioles, with fibrosis and infiltration with macrophages and T‐lymphocytes. There is destruction of lung parenchyma and an increased number of macrophages and T‐lymphocytes, with a greater increase in CD8+ (cytotoxic) than CD4+ (helper) cells 9. Bronchial biopsies show similar changes with an infiltration of macrophages and CD8+ cells and an increased number of neutrophils in patients with severe COPD 10. Bronchoalveolar lavage (BAL) fluid and induced sputum demonstrate a marked increase in macrophages and neutrophils 11, 12. In contrast to asthma, eosinophils are not prominent except during exacerbations or when patients have concomitant asthma 8, 13. What are the predominant mechanisms of airflow limitation? Fixed narrowing of small airways, emphysema and luminal obstruction with mucus secretions may all contribute to airflow limitation in COPD, but there is debate about which mechanism is most important. There are differences between patients and at different stages of disease progression in the contribution of each of these processes but problems in making accurate measurements in patients has made it difficult to evaluate the importance of each mechanism in an individual patient. It has long been recognised that there is narrowing of small airways in patients with COPD 14–17. There is an increase in the thickness of small airways with increased formation of lymphoid follicles and deposition of collagen in the outer airway wall that may restrict airway opening 18. The lumen of small airways is reduced by mucosal thickening containing an inflammatory exudate, which increases with the severity of disease. The mechanism for lymphoid follicle formation in more severe disease is unknown, but may reflect a response to chronic bacterial colonisation and acute exacerbations of inflammation. The mechanisms of fibrosis around the airway are not yet understood, but are likely to represent an attempt to repair chronic inflammation. The role of specific growth factors, such as transforming growth factor‐β (TGF‐β) which shows increased expression in peripheral airways 19, 20 and connective tissue growth factor (CTGF) are not yet known. TGF‐β may induce fibrosis via the release of CTGF which may stimulate collagen deposition in the airways 21, 22. Amajor barrier to understanding the contribution of small airway obstruction is the difficulty in quantifying small airway obstruction in patients using measurements of airflow due to the high variability and poor reproducibility of measurements 23. Both panacinar and centrilobular emphysema may occur in smokers 24. The role of emphysema in causing airflow obstruction in COPD have been examined by measuring macroscopic emphysema in resected lung or on computerised tomography (CT) scans in relation to tests of lung function, or by measuring static transpulmonary pressure (PL) as a measurement of alveolar disease. Many studies have shown significant, albeit weak, correlations between the grading of macroscopic emphysema and various tests of lung function 25, 26. However, the assessment of macroscopic emphysema is dominated by destroyed or poorly functioning lung, whereas lung function tests reflect predominantly the function of the best surviving lung. In the extreme case of nonventilated emphysematous bullae surrounded by normal lung, the two assessments are virtually independent, with lung function tests measuring only the reduced volume of surviving lung. In more common types of emphysema, a simple two compartment model does not apply, but usually there will be greater heterogeneity of disease with more and more units becoming poorly functional as disease progresses, resulting in a rise in residual volume and a fall in vital capacity. Thus the strength of the correlation between assessment of gross emphysema and lung function will depend on the severity and homogeneity of “microscopic” disease in the less affected lung which is not often measured. PL (measured using an oesophageal catheter) is plotted against airflow conductance or maximal expiratory flow at different lung volumes to indicate the contribution of alveolar disease (and by implication emphysema) to airflow limitation, with the assumption that the rest is due to intrinsic airway disease 27–29. However, it is not certain that the magnitude of decline in PL accurately reflects the severity of emphysema and its effects on the airways. Reduction in PL is likely to be largest with relatively uniform emphysema, as occurs in panacinar emphysema (e.g. α1‐antitrypsin deficiency), whereas patchy centrilobular emphysema may have near normal PL. Indeed, uniform “microscopic” emphysema might account for functional “pseudoemphysema” without any CT change. In practice a reduction in conductance or maximum flow that is completely explained by a reduction in PL is unusual, except in mild disease. Retrograde catheter studies in excised lungs from patients with severe airflow obstruction due to COPD have all found large increases in peripheral resistance at standard PL 30–32. But there are many other possible changes in airway function due to emphysema which would result in an increased resistance at a given PL, including abnormal angulation or compression of normal airways by surrounding overdistended lung, loss of parallel airways due to emphysematous destruction, or to functional loss of patent airways supplying poorly ventilated areas of lung. The effects of emphysema may not always reduce PL, e.g. a short stenosis caused by local loss of alveolar attachments. Present analyses of airway morphology are not sufficient to reveal the anatomical basis of the consistent physiological finding of an increase in peripheral airflow resistance. Assuming that the increase is all due to “intrinsic” disease of the peripheral airways underestimates the role of emphysema. Emphysema may play a more prominent role in severe disease as the decline in lung function accelerates. The contribution of mucus hypersecretion to airflow limitation in COPD is still uncertain. Although early studies supported the view that mucus hypersecretion was not associated with any physiological defect 33, 34, more recent studies have demonstrated that mucus hypersecretion may be a potential risk factor for accelerated decline in lung function 35, 36. The early studies examined the early stages of COPD and also included an occupational cohort. The most likely mechanism whereby chronic mucus hypersecretion contributes to progression of COPD may be due to the increased risk of exacerbations that appear to accelerate loss of forced expiratory volume in one second (FEV1) 37. Chronic mucus hypersecretion may contribute little in the early phases of COPD when exacerbations are infrequent. It is possible that chronic mucus hypersecretion may reflect the inflammatory process around submucosal glands 38 and may reflect the intensity of inflammation in more peripheral airways. Increased numbers of neutrophils and mast cells have also been found around submucosal glands 38, 39 and serine proteases and mast cell chymase are potent mucus secretagogues 40–42. In severe COPD chronic mucus hypersecretion is associated with mortality and this may also reflect an increased risk of terminal infection 43–45. Chronic cough and mucus production in smokers with normal lung function(GOLD Stage 0) do not appear to predict the later development of COPD 46. What are the key inflammatory cells? COPD, like asthma, is a complex inflammatory disease that involves several types of inflammatory cells and multiple inflammatory mediators. However, the pattern of inflammation and the spectrum of mediators differ between these two airway diseases, at least in the stable state of the disease. Although abnormal numbers of inflammatory cells have been documented in COPD, the relationship between these cell types and the sequence of their appearance and their persistence are largely unknown. Most studies have been cross-sectional based on selection of patients with different stages ofthe disease and comparisons have been made between smokers without airflow limitation (normal smokers) and those with COPD who have smoked a similar amount. There are no serial studies and selection biases (such as selecting tissue from patients suitable for lung volume reduction surgery) may give misleading results. Analysis of the cell profile in alveoli and small airways shows an increase in all ofthe cell types implicated in COPD, including macrophages, T‐lymphocytes, B‐lymphocytes and neutrophils 47. Increased numbers of activated neutrophils are found in sputum and BAL fluid of patients with COPD 12, 48, yet there are only relatively small increases in the airways or lung parenchyma 49. This may reflect their rapid transit through the airways and parenchyma. Neutrophils secrete serine proteases, including neutrophil elastase (NE), cathepsin G and proteinase‐3, as well as matrix metalloproteinase (MMP)‐8 and MMP‐9, which may contribute to alveolar destruction. These serine proteases are also potent mucus stimulants. Neutrophil recruitment to the airways and parenchyma involves adhesion to endothelial cells and E‐selectin is upregulated on endothelial cells in the airways of COPD patients 50. Adherent neutrophils then migrate into the respiratory tract under the direction of neutrophil chemotactic factors, which include interleukin (IL)‐8 and leukotriene B4 (LTB4). Neutrophil survival in the respiratory tract may be increased by cytokines, such as granulocyte-macrophage colony stimulating factor (GM‐CSF) and granulocyte colony stimulating factor (G‐CSF). The role of neutrophils in COPD is not yet clear. There is a correlation between the number of circulating neutrophils and fall in FEV1 51. Neutrophil numbers in bronchial biopsies and induced sputum are correlated with COPD disease severity 10, 12 and with the rate of decline in lung function 52. Smoking has a direct stimulatory effect on granulocyte production and release from the bone marrow, possibly mediated by GM‐CSF and G‐CSF released from lung macrophages 53. Smoking may also increases neutrophil retention in the lung 54. There is no doubt that the neutrophils recruited to the airways of COPD patients are activated as there are increased concentrations of granule proteins, such as myeloperoxidase and human neutrophil lipocalin, in the sputum supernatant 55–57. These neutrophils also show an increase in the respiratory burst response which correlates with the degree of airflow limitation 58. Neutrophils have the capacity to induce tissue damage through the release of serine proteases and oxidants. Priming is a prerequisite for degranulation and superoxide anion generation in neutrophils 59. Neutrophils in the peripheral circulation show evidence of priming in COPD 60, but this may result from, rather than contribute to, lung pathophysiology. There are several chemotactic signals that have the potential for neutrophil recruitment in COPD, including LTB4, IL‐8 and related CXC chemokines, including GRO‐α (growth-related oncoprotein) and ENA‐78 (epithelial neutrophil activating protein of 78 kDa) which are increased in COPD airways 61, 62. These mediators may be derived from alveolar macrophages and epithelial cells, but the neutrophil itself may be a major source of IL‐8 63. Neutrophils from the circulation marginate in the pulmonary circulation and adhere to endothelial cells in the alveolar wall before passing into the alveolar space 64. The precise route for neutrophil migration in large airways is less certain,but it is more likely that they reach the airway from the tracheobronchial circulation and migrate across post-capillary venules 65. The cellular mechanisms underlying neutrophil adhesion and transmigration differ between systemic and pulmonary circulations and this might confer different properties on the neutrophils arriving from the alveolar or bronchial compartments. There may be significant differences in neutrophil transit times in different areas of the lung that may account for differential distribution of emphysema, for example the upper lobe predominance in centrilobular emphysema. Little is known about survival and apoptosis of neutrophils in COPD airways. Theoretically GM‐CSF may prolong neutrophil survival but it has proved difficult to culture neutrophils from sputum samples. However, while neutrophils have the capacity to cause elastolysis, this is not a prominent feature of other pulmonary diseases where chronic airway neutrophilia is even more prominent, including cystic fibrosis and bronchiectasis. This suggests that other factors are involved in the generation of emphysema. Indeed there is a negative association between the number of neutrophils and the amount of alveolar destruction in COPD 49 and neutrophils are not a prominent feature of parenchymal inflammation in COPD. It is likely that airway neutrophilia is linked to mucus hypersecretion in chronic bronchitis, however. Serine proteases from neutrophils, including neutrophil elastase, cathepsin G and proteinase‐3 are all potent stimulants of mucus secretion from submucosal glands and goblet cells in the epithelium 40, 42. Macrophages appear to play a pivotal role in the pathophysiology of COPD and can account for most of the known features of the disease (fig. 1⇓) 66, 67. Macrophages may play a pivotal role in chronic obstructive pulmonary disease (COPD) as they are activated by cigarette smoke extract and secrete many inflammatory proteins that may orchestrate the inflammatory process in COPD. Neutrophils may be attracted by interleukin (IL)‐8, growth-related oncogene‐α (GRO‐α) and leukotriene B4 (LTB4), monocytes by macrophage chemotactic protein‐1 (MCP‐1), and CD8+ lymphocytes by interferon‐γ inducible protein (IP‐10), monokine-induced by interferon‐γ (Mig) and interferon-inducible T‐cell α‐chemoattractant (I‐TAC). Release of elastolytic enzymes including matrix metalloproteinases (MMP) and cathepsins cause elastolysis, and release of transforming growth factor (TGF‐β) and connective tissue growth factor (CTGF). Macrophages also generate reactive oxygen species (ROS) and nitric oxide (NO) which together form peroxynitrite and may contribute to steroid resistance. There is a marked increase (5–10 fold) in the numbers of macrophages in airways, lung parenchyma, BAL fluid and sputum in patients with COPD. A careful morphometric analysis of macrophage numbers in the parenchyma of patients with emphysema showed a 25-fold increase in the numbers of macrophages in the tissue and alveolar space compared with normal smokers 47. Furthermore, macrophages are localised to sites of alveolar wall destruction in patients with emphysema 49, 68. There is a correlation between macrophage numbers in the airways and the severity of COPD 10. Macrophages may be activated by cigarette smoke extract to release inflammatory mediators, including tumour necrosis factor (TNF)‐α, IL‐8, other CXC chemokines, monocyte chemotactic peptide (MCP)‐1, LTB4 and reactive oxygen species, providing a cellular mechanism that links smoking with inflammation in COPD. Alveolar macrophages also secrete elastolytic enzymes, including MMP‐2, MMP‐9, MMP‐12, cathepsins K, L and S and neutrophil elastase taken up from neutrophils 69, 70. Alveolar macrophages from patients with COPD secrete more inflammatory proteins and have a greater elastolytic activity at baseline than those from normal smokers and this is further increased by exposure to cigarette smoke 70–72. Macrophages demonstrate this difference even when maintained in culture for 3 days and therefore appear to be intrinsically different from the macrophages of normal smokers and nonsmoking normal control subjects 70. The predominant elastolytic enzyme secreted by alveolar macrophages in COPD patients is MMP‐9. Most of the inflammatory proteins that are upregulated in COPD macrophages are regulated by the transcription factor nuclear factor‐κB (NF‐κB) which is activated in alveolar macrophages of COPD patients, particularly during exacerbations 73, 74. 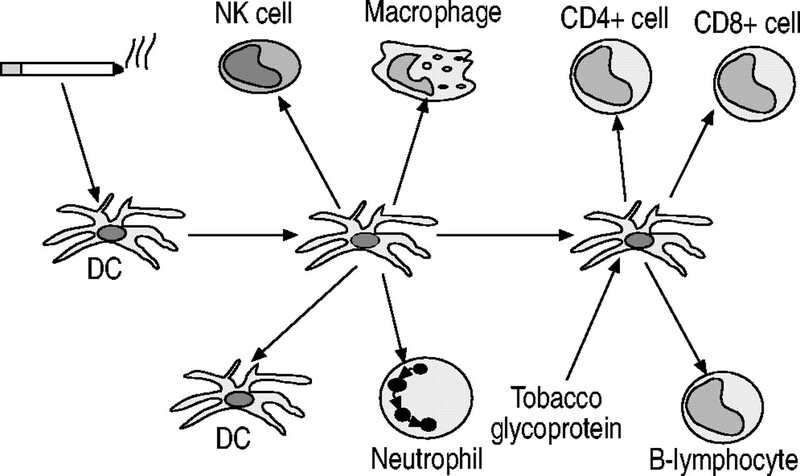 The increased numbers of macrophages in smokers and COPD patients may be due to increased recruitment of monocytes from the circulation in response to monocyte-selective chemokines. The monocyte-selective chemokine MCP‐1 is increased in sputum and BAL of patients with COPD 61, 75, with increased expression in macrophages 76. CXC chemokines are also chemoattractant to monocytes acting via CXCR2 and the concentration of the CXC chemokine GRO‐α is markedly increased in sputum and BAL of patients with COPD 61. Monocytes from patients with COPD show a greater chemotactic response to GRO‐α than cells from normal smokers and nonsmokers, but this is not explained by an increase in CXCR2 77. Interestingly, while all monocytes express CCR2, the receptor for macrophage inflammatory protein‐1, only ∼30% of monocytes express CXCR2. It is possible that these CXCR2‐expressing monocytes transform into macrophages that behave differently, e.g. release more inflammatory proteins. Macrophages also have the capacity to release the chemokines interferon‐γ inducible protein (IP‐10), interferon-inducible T‐cell α‐chemoattractant (I‐TAC) and monokine-induced by interferon‐γ (Mig),which are chemotactic for CD8+ Tc1 cells via interaction with the CXCR3 receptor expressed on these cells 78. The increased numbers of macrophages in COPD may be due to increased recruitment of monocytes, but may also be due to increased proliferation and prolonged survival in the lungs. Macrophages have a very low proliferation rate in the lungs, but the present authors' have demonstrated that there is some increase in cell proliferation measured by proliferative cell nuclear antigen (PCNA) 79. Macrophages have a long survival time so this is difficult to measure directly. However in macrophages from smokers, there is markedly increased expression of the anti-apoptotic protein Bcl‐XL and increased expression of p21CIP/WAF1 in the cytoplasm 79. This suggests that macrophages may have a prolonged survival in smokers and patients with COPD. Corticosteroids are ineffective in suppressing inflammation, including cytokines, chemokines and proteases, in patients with COPD 80, 81. In vitro the release of IL‐8, TNF‐α andMMP‐9 macrophages from normal subjects and normal smokers are inhibited by corticosteroids, whereas corticosteroids are ineffective in macrophages from patients with COPD 82. Curiously, this does not apply to GM‐CSF which does not appear to have increased secretion in COPD and is suppressed by corticosteroids, albeit to a lesser extent than in macrophages from normal smokers. The reasons for resistance to corticosteroids in COPD and to a lesser extent macrophages from smokers may be the marked reduction inactivity of histone deacetylase (HDAC) 83, which is recruited to activated inflammatory genes by glucocorticoid receptors to switch off inflammatory genes 84. The reduction in HDAC activity in macrophages is correlated with increased secretion of cytokines like TNF‐α and IL‐8 and reduced response to corticosteroids. The reduction of HDAC activity on COPD patients may be mediated through oxidative stress and peroxynitrite formation. Although corticosteroids are not effective in inhibiting the secretion of cytokines and proteases from macrophages, other drugs may be beneficial. Theophylline in low concentrations increases HDAC activity in alveolar macrophages and in vitro reverses the steroid resistance induced by oxidative stress 85. Resveratrol, a flavenoid found in red wine, is an effective inhibitor of cytokine expression from macrophages from COPD patients, but its molecular mechanisms of action have not yet been determined 86. Macrophages are phagocytic for bacteria and play an important role in host defence. The phagocytic potential of macrophages from COPD patients has not been explored, but it is possible that impaired phagocytosis may result in the increased bacterial load in the respiratory tract of patients with COPD. Macrophages recognise apoptotic cells via expression of phosphatidylserine (PS) which interacts with specific receptors on the macrophage surface 87. Ingestion of apoptotic granulocytes by macrophages induces the secretion of TGF‐β1 88. Neutrophil elastase cleaves the PS receptor and may thus impair the ability of macrophages to take up apoptotic neutrophils, resulting in increased numbers of apoptotic neutrophils in the airways 89. There is an increase in the total numbers of T‐lymphocytes in lung parenchyma, peripheral and central airways of patients with COPD, with the greater increase in CD8+ than CD4+ cells 47, 49, 90–92. There is a correlation between the numbers of T‐cells and the amount of alveolar destruction and the severity of airflow obstruction. There is also an increase in the absolute number of CD4+ T‐cells, but the ratio of CD4+:CD8+ cells is reversed in COPD. This is mainly found in smokers with COPD rather than smokers without evidence of airflow limitation 90. It is not known whether these cells are classified as Tc1 (interferon‐γ producing) or Tc2 (IL‐4 producing) subtypes 93, but there is evidence that the majority of T‐cells in COPD airways are of the Tc1 subtype 78. CD8+ and CD4+ T‐cells show increased expression of activation markers compared to T‐cells in the circulation, although there is no clear difference between patients with COPD and normal controls 94. The mechanisms by which CD8+, and to a lesser extent CD4+ cells, accumulate in the airways and lungs of patients with COPD is not yet understood. However, homing of T‐cells to the lung must depend upon some initial activation then adhesion and selective chemotaxis. T‐cells in peripheral airways of COPD patients show increased expression of CXCR3, a receptor activated by IP‐10, Mig and I‐TAC. There is increased expression of IP‐10 by bronchiolar epithelial cells and this could contribute to the accumulation of CD8+ cells, which preferentially express CXCR3 78. There is also an increase in the numbers of CD8+ cells in the circulation in COPD patients who do not smoke 95, 96 and an increase in T‐helper type 1 (interferon (IFN)‐γ producing) CD4+ cells in COPD patients 97. This indicates thatthere may be chronic immune stimulation via antigens presented via the HLA Class 1 pathway. Dendritic cells may migrate from the airways to regional lymph nodes and stimulate proliferation of CD8+ and CD4+ T‐cells. CD8+ cells are typically increased in airway infections and it is possible that the chronic colonisation of the lower respiratory tract of COPD patients by bacterial and viral pathogens is responsible for this inflammatory response 98. It is also possible that protease-induced lung injury may uncover previously sequestered autoantigens or that cigarette smoke itself may damage airway epithelial cells and make them antigenic 99. The role of increased numbers of CD4+ cells in COPD, particularly in severe disease is also unknown 47; it is possible that they have immunological memory and play a role in perpetuating the inflammatory process in the absence of cigarette smoking. Natural killer (NK, CD56+) cells are the first line of defence against viral infections. Circulating NK cells are reduced in patients with COPD and have reduced phagocytic activity 100 and similar findings are found in normal smokers 101, although no difference in NK cells was found in lung parenchyma of COPD patients 90. There is an increase in γ/δ T‐cells in alveoli of smokers, whether they have airway obstruction or not 90. The role of T‐cells in the pathophysiology of COPD is not yet certain. CD8+ cells have the capacity to cause cytolysis and apoptosis of alveolar epithelial cells through release of perforins, granzyme‐B and TNF‐α 102. There is an association between CD8+ cells and apoptosis of alveolar cells in emphysema 90. In a mouse model of cigarette-induced emphysema there is a predominance of T‐cells which are directly related to the severity of emphysema 103. The role of eosinophils in COPD is uncertain. There are some reports of increased numbers of inactive eosinophils in the airways and lavage of patients with stable COPD, whereas others have not found increased numbers in airway biopsies, BAL or induced sputum 104. The presence of eosinophils in patients with COPD predicts a response to corticosteroids and may indicate coexisting asthma 105, 106. Increased numbers of eosinophils have been reported in bronchial biopsies and BAL fluid during acute exacerbations of chronic bronchitis 107, 108. Surprisingly the levels of eosinophil basic proteins in induced sputum are as elevated in COPD, as in asthma, despite the absence of eosinophils, suggesting that they may have degranulated and are no longer recognisable by microscopy 55. Perhaps this is due to the high levels of neutrophil elastase that have been shown to cause degranulation of eosinophils 109. The dendritic cell plays a central role in the initiation of theinnate and adaptive immune response 110. The airways and lungs contain a rich network of dendritic cells that are localised near the surface, so that they are ideally located to signal the entry of foreign substances that are inhaled 111. Dendritic cells can activate a variety of other inflammatory and immune cells, including macrophages, neutrophils, T‐ and B‐lymphocytes 112. It therefore likely that the dendritic cell may play an important role in the pulmonary response to cigarette smoke and other inhaled noxious agents and may therefore be a key cellular element in COPD (fig. 2⇓). The mechanism by which tobacco smoke activates the immune system is not yet inderstood, but a glycoprotein isolated fromtobacco has powerful immunostimulatory actions 113. There is an increase in the number of dendritic cells in rat lungs exposed to cigarette smoke 114 and in the airways and alveolar walls of smokers 115, 116. Pulmonary histiocytosis is a disease caused by dendritic cell granulomata in the lung and is characterised by destruction of the lung parenchyma that resembles emphysema 117, 118. The adult form of the disease occurs almost exclusively in smokers. In mice exposed to chronic cigarette smoke there is an increase in dendritic cells in the airways and lung parenchyma 119. The role ofdendritic cells in recruiting other effector cells in COPD deserves further study. Dendritic cells (DC) may play an important role in the pathophysiology of chronic obstructive pulmonary disease as they can be activated by cigarettte smoking and by tobacco glycoprotein resulting in recruitment of neutrophils, macrophages, natural killer (NK) cells, CD4+ and CD8+ T‐lymphocytes and B‐lymphocytes. Airway and alveolar epithelial cells may be an important source of inflammatory mediators and proteases in COPD. Epithelial cells are activated by cigarette smoke to produce inflammatory mediators, including TNF‐α, IL‐1β, GM‐CSF and IL‐8 120–122. Epithelial cells in small airways may be an important source of TGF‐β, which then induces local fibrosis 20. Vascular endothelial growth factor (VEGF) appears to be necessary to maintain alveolar cell survival and blockade of VEGF receptors (VEGFR2) in rats induces apoptosis of alveolar cells and an emphysema-like pathology 123. However, the role of VEGF in the pathogenesis of human emphysema is not yet known. Airway epithelial cells are also important in defence of the airways. Mucus produced from goblet cells traps bacteria and inhaled particulates 124. Epithelial cells secrete defensins and other cationic peptides with antimicrobial effects and are part of the innate defence system, but are also involved in tissue repair processes 125. They also secrete antioxidants aswell as antiproteases, such as secretory leukoprotease inhibitor (SLPI). Epithelial cells also transport immunoglobulin A and are therefore also involved in adaptive immunity 126. It is possible that cigarette smoke and other noxious agents impair these innate and adaptive immune responses of the airway epithelium, increasing susceptibility to infection. The airway epithelium in chronic bronchitis and COPD often shows squamous metaplasia, which may result from increased proliferation of airway epithelial cells. Proliferation in basal airway epithelial cells, measured by PCNA is increased in some normal smokers, but is markedly increased in patients with chronic bronchitis and correlates with the degree of squamous metaplasia 127. The nature of the growth factors involved in epithelial cell proliferation, cell cycle and differentiation in COPD are not yet known. Epithelial growth factor receptors show increased expression in airway epithelial cells of smokers and may contribute to basal cell proliferation, resulting in squamous metaplasia and an increased risk of bronchial carcinoma 128. What is the role of oxidative stress? Oxidative stress occurs when reactive oxygen species (ROS) are produced in excess of the antioxidant defence mechanisms and result in harmful effects, including damage to lipids, proteins and deoxyribonucleic acid (DNA). There is increasing evidence that oxidative stress is an important feature in COPD 129–131. Inflammatory and structural cells that are activated in the airways of patients with COPD produce ROS, including, neutrophils, eosinophils, macrophages, and epithelial cells 130. Superoxide anions (O2.-) are generated by reduced nicotinamine adenine dinucleotide phosphate (NADPH) oxidase and this is converted to hydrogen peroxide (H2O2) by superoxide dismutases. H2O2 is then dismuted to water by catalase. O2.- and H2O2 may interact in the presence of free iron to form the highly reactive hydroxyl radical (.OH). O2.- may also combine with NO to form peroxynitrite, which also generates .OH 132. Oxidative stress leads to the oxidation of arachidonic acid and the formation of a new series of prostanoid mediators called isoprostanes, which may exert significant functional effects 133, including bronchoconstriction and plasma exudation 134–136. Granulocyte peroxidases, such as myeloperoxidase in neutrophils, play an important role in oxidative stress. In neutrophils H2O2 generated from O2- is metabolised by myeloperoxidase in the presence of chloride ions to hypochlorous acid which is a strong oxidant. Myeloperoxidase is also able to nitrate tyrosine residues, as can peroxynitrite 137–139. The normal production of oxidants is counteracted by several antioxidant mechanisms in the human respiratory tract 140. The major intracellular antioxidants in the airways are catalase, superoxide dismutase (SOD) and glutathione, formed by the enzyme γ‐glutamyl cysteine synthetase, and glutathione synthetase. Oxidant stress activates the inducible enzyme haem oxygenase‐1 (HO‐1), converting haem and haemin to biliverdin with the formation of carbon monoxide (CO) 141. Biliverdin is converted via bilirubin reductase to bilirubin, which is a potential antioxidant. HO‐1 is widely expressed in human airways 142 and CO production is increased in COPD 143. In the lung intracellular antioxidants are expressed at relatively low levels and are not induced by oxidative stress, whereas the major antioxidants are extracellular 144. Extracellular antioxidants, particularly glutathione peroxidase, are markedly upregulated in response to cigarette smoke and oxidative stress. The glutathione system is the major antioxidant mechanism in the airways. There is a high concentration of reduced glutathione in lung epithelial lining fluid 140 and concentrations are increased in cigarette smokers. Extracellular glutathione peroxidase (eGPx) is an important antioxidant in the lungs and may be secreted by epithelial cells and macrophages, particularly in response to cigarette smoke or oxidative stress 145. eGPx inactivates H2O2 and O2-, but may also block reactive nitrogen species 144.Extracellular antioxidants also include the dietary antioxidants vitamin C (ascorbic acid) and vitamin E (α‐tocopherol), uric acid, lactoferrin and extracellular SOD3. SOD3 is highly expressed in human lung, but its role in COPD is not yet clear 146. ROS have several effects on the airways, which would have the effect of increasing the inflammatory response. These effects may be mediated by direct actions of ROS on target cells in the airways, but may also be mediated indirectly via activation of signal transduction pathways and transcription factors and via the formation of oxidised mediators such as isoprostanes and hydroxyl-nonenal. ROS activate NF‐κB, which switches on multiple inflammatory genes resulting in amplification of the inflammatory response 147. The molecular pathways by which oxidative stress activates NF‐κB have not been fully elucidated, but there are several redox-sensitive steps in the activation pathway 148. Many of the stimuli that activate NF‐κB appear to do so via the formation of ROS, particularly H2O2. ROS activate NF‐κB in an epithelial cell line 149 and increase the release of pro-inflammatory cytokines from cultured human airway epithelial cells 150. Oxidative stress results in activation of histone acetyltransferase activity which opens up the chromatin structure and is associated with increased transcription of multiple inflammatory genes 151, 152. Another transcription factor that activates inflammatory genes is activator protein‐1 (AP‐1), a heterodimer of Fos and Jun proteins. As with NF‐κB there are several redox-sensitive steps in the activation pathway 153. Exogenous oxidants may also be important in worsening airway disease. Cigarette smoke, ozone and, to a lesser extent, nitrogen dioxide, impose an oxidative stress on the airways 154. Oxidants also activate mitogen-activated protein (MAP) kinase pathways. H2O2 is a potent activator of extracellular regulated kinases and p38 MAP kinase pathways that regulate the expression of many inflammatory genes and survival in certain cells, and the spreading of macrophages 155. Indeed many aspects of macrophage function are regulated by oxidants through the activation of multiple kinase pathways 156. There is considerable evidence for increased oxidative stress in COPD 129, 130. Cigarette smoke itself contains a high concentration of ROS 157. Inflammatory cells, such as activated macrophages and neutrophils, also generate ROS, as discussed above. Epidemiological evidence indicates that reduced dietary intake of antioxidants may be a determinant of COPD and population surveys have linked a low dietary intake of the antioxidant ascorbic acid (vitamin C) with worse lung function 158, 159. There are several markers of oxidative stress that may be detected in the breath and several studies have demonstrated increased production of oxidants in exhaled air or breath condensates 160–162. There is an increased concentration of H2O2 in exhaled breath condensate of patients with COPD, particularly during exacerbations 163, 164. There is also an increase in the concentration of 8‐isoprostaglandin F2α (8‐isoprostane) in exhaled breath condensate, which is found even in patients who are exsmokers 165 and is increased further during acute exacerbations 166. Isoprostane is also increased in the breath of normal smokers, but to a lesser extend than in COPD, suggesting that there is an exaggeration of oxidative stress in COPD. 8‐Isoprostane is similarly increased in the urine of patients with COPD and further increased during exacerbations 167. There is also evidence for increased systemic markers of oxidative stress in patients with COPD as measured by biochemical markers of lipid peroxidation 168. A specific marker lipid peroxidation 4‐hydoxy‐2‐nonenal which forms adducts with basic amino acid residues in proteins can be detected by immunocytochemistry and has been detected in lungs of patients with COPD 169. This signature of oxidative stress is localised to airway and alveolar epithelial cells, endothelial cells and neutrophils. The increased oxidative stress in the airways of COPD patient may play an important pathophysiological role in the disease by amplifying the inflammatory response in COPD. This may reflect the activation of NF‐κB and AP‐1, which then induce a neutrophilic inflammation via increased expression of IL‐8 and other CXC chemokines, TNF‐α and MMP‐9. NF‐κB is activated in airways and alveolar macrophages of patients with COPD and is further activated during exacerbations 73, 74. It is likely that oxidative stress is an important activator of this transcription factor in COPD patients. Oxidative stress may also impair the function of antiproteases such as α1‐antitrypsin and SLPI, and thereby accelerate the breakdown of elastin in lung parenchyma 170. Corticosteroids are much less effective in COPD than in asthma and do not reduce the progression of the disease 171–174. In contrast to patients with asthma, those with COPD do not show any significant anti-inflammatory response to corticosteroids 80, 81. Alveolar macrophages from patients with COPD show a marked reduction in responsiveness to the anti-inflammatory effects of corticosteroids, compared to cells from normal smokers and nonsmokers 82. Recent studies suggest that there may be a link between oxidative stress and the poor response to corticosteroids in COPD. Oxidative stress impairs binding of glucocorticoid receptors to DNA and the translocation of these receptors from the cytoplasm to the nucleus 175, 176. Corticosteroids switch off inflammatory genes by recruiting HDAC2 to the active transcription site and by deacetylating the hyperacetylated histones of the actively transcribing inflammatory gene, they are able to switch off its transcription and thus suppress inflammation 84, 177. In cigarette smokers and patients with COPD there is a marked reduction in activity of HDAC and reduced expression of HDAC2 in alveolar macrophages 83 and an even greater reduction in HDAC2 expression in peripheral lung tissue 178. This reduction in HDAC activity is correlated with reduced suppression of inflammatory cytokines and a reduced response to corticosteroids. This may result directly or indirectly from oxidative stress and is mimicked by the effects of H2O2 in cell lines 178. Oxidative stress may also induce apoptosis in endothelial and epithelial cells. Apoptosis of type 1 pneumocytes may be contributory to the development of emphysema and this might be induced by cytotoxic T‐lymphocytes or by inhibition of vascular-endothelial growth factor receptors 90, 123. ROS may induce apoptosis by activating the NF‐κB pathway, by direct DNA damage via activation of polyadenosine diphosphate ribose and via the generation of 4‐hydroxy-nonenal. Apoptosis signal-regulating kinase‐1 is held in an inactive conformation by thioredoxin and when oxidised by ROS this triggers apoptotic pathways 179. It has long been proposed that various proteases break down connective tissue components, particularly elastin, in lung parenchyma to produce emphysema and that there is an imbalance between proteases and endogenous antiproteases which should normally protect against protease-mediated effects. Elastin may be the most important target for these enzymes as there is a loss of elasticity in the lung parenchyma in patients with emphysema and elastin cannot be regenerated in an active form. Evidence for elastin degradation in COPD is provided by the increased excretion of desmosine, derived from elastin cross-links, in smokers with rapid decline in lung function compared to those with a normal decline 180. Although early attention was focussed on neutrophil elastase (NE), many other proteases that have the capacity to degrade elastin have now been implicated 181. There has been particular emphasis on the role of NE since patients with inherited α1‐antitrypsin (α1‐AT) deficiency were shown to develop early onset emphysema. Furthermore the demonstration that α1‐AT may be inactivated by cigarette smoke exposure raised the possibility that neutrophil elastase may also be important in smokers with normal plasma α1‐AT concentrations. This was supported by animal models in which tracheal instillation of NE induces emphysema and infiltration of neutrophils 182 and immunocytochemical localisation of NE on elastin fibres in the lung parenchyma of patients with emphysema 183. NE (E.C.3.4.21.37) is a serine protease which is inhibited by α1‐AT in the lung parenchyma. It is stored in azurophilic granules in neutrophils and in cells primed by cytokines it may be expressed on the cell surface 184. NE has subsequently been shown to have several other actions relevant to its potential role in COPD. It is a potent mucus secretagogue of submucosal gland cells and goblet cells 40, 185. NE induces the expression of MUC5AC in an epithelial cell line and this mechanism appears to be dependent on the generation of reactive oxygen species 186, 187. NE also induces the expression of some cytokines, including IL‐8 in airway epithelial cells 188. NE cleaves the phosphatidylserine receptor on macrophages, thus impairing their ability to clear apoptotic cells 89. On the other hand NE also inactivates CD14, a cell surface receptor for lipopolysaccharide, thus reducing the inflammatory response to endotoxin 189. NE is likely to play a role in host defence and NE(-/-) mice have increased susceptibility to overwhelming Gram-negative bacterial infections, but do not appear to have any increase in spontaneous infections 190, 191. The role of NE in COPD will only be established when the effect of NE inhibitors has been studied clinically 192. In guinea pigs exposed to cigarette smoke a NE inhibitor markedly reduced emphysema and the neutrophil inflammatory response 193. Although several NE inhibitors have been tested in humans there are few results reported. It is not certain whether the drugs failed or the clinical trials were not adequately designed. An NE inhibitor MR889 had no effect on urinary desmosine in unselected COPD patients, but a small reduction was seen in patients with a relatively short history 194. The macrolide antibiotics erythromycin and flurithromycin have also been shown to inhibit NE activity 195 and this might account for their beneficial effect on mucus hypersecretion 196. Neutrophils also store two other serine proteases cathepsin G and proteinase 3 in their specific granules. These other serine proteases have similar properties to NE and induce mucus secretion in a similar way 40, 42. Proteinase 3 is potently expressed on the surface of neutrophils after activation with cytokines 197. Proteinase 3 is potently inhibited by α1‐AT 198. The neutrophil elastase inhibitors in development inhibit other serine proteases 192. Lysosomal cysteine proteases (cathepsins) may also be involved in COPD 199, 200. Cathepsin S expression is induced by interferon‐γ in several cell types, including smooth muscle cells. Overexpression of IFN‐γ induces emphysema in mice and there is increased expression of cathepsins B, D, H, L and S 201. Cathepsin inhibitors markedly reduce the emphysema-induced IL‐13 transgenic mice, indicating the elastolytic potential of this cathepsin 202. Several other cathepsins also have elastolytic activity, including cathepsins B, K and L, which are expressed in alveolar macrophages 69,203 and cathepsin W in CD8+ T‐cells 204. The role of cathepsins in COPD is uncertain. Increased concentrations of cathepsin L have been detected in BAL fluid of patients with emphysema 205 and alveolar macrophages from patients with COPD secrete more cysteine protease activity than macrophages from normal smokers or nonsmokers 70. The endogenous inhibitors of cathepsins are cystatins and stefins, but little is known about their role in COPD. Cystatin C concentrations are increased in BAL fluid of patients with COPD 205. There is increasing evidence for a role for MMPs in COPD 206. In patients with emphysema there is an increase in BALconcentrations and macrophage expression of MMP‐1 (collagenase) and MMP‐9 (gelatinase B) 81, 207, 208. 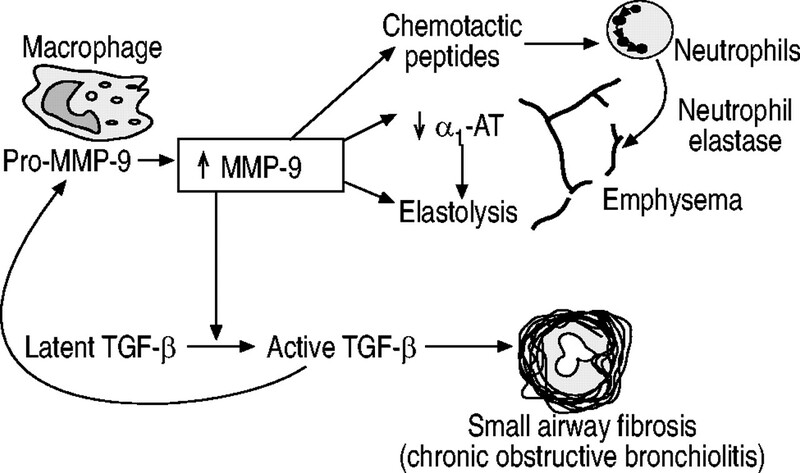 There is an increase in activity of MMP‐9 in the lung parenchyma of patients with emphysema 209. MMP‐1 expression is also increased in the lungs of patients with emphysema, with predominant localisation to type II pneumocytes 210. Alveolar macrophages from normal smokers express more MMP‐9 than those from normal subjects 72 and there is an ever greater increase in cells from patients with COPD 71, which have greatly enhanced elastolytic activity 70. Indeed, using the MMP inhibitor marimastat it was shown that MMPs account for most of the elastolytic activity released from alveolar macrophages from COPD patients over prolonged periods 70. The interest in MMPs has been heightened by the demonstration that emphysema induced by chronic cigarette exposure is prevented in MMP‐12-/- (macrophage metalloelastase) mice 211. In MMP12-/- mice emphysema induced by IL‐13 and IFN‐γ overexpression is reduced 201, 202 and there is a marked reduction in the recruitment of monocytes into the lung. This may be because MMPs generate chemotactic peptides which promote macrophage recruitment to the parenchyma and airways. MMPs may activate the latent form of TGF‐β to its active form. In addition, mice in which the integrin αvβ6 is deleted (Itgb6‐null mice) fail to activate TGF‐β and develop age-related emphysema which is prevented in MMP12-/- mice and by overexpression of TGF‐β1 212. This suggests that TGF‐β1 downregulates MMP‐12 under normal conditions and absence of TGF‐β results in excessive MMP‐12 and emphysema. MMP‐9-/- mice are not protected against emphysema induced by cigarette smoke, but are protected from small airway fibrosis 213. TGF‐β1 is activated by MMP‐9 214; this may be mediated via MMP‐9 induced proteolytic cleavage of latent TGF‐binding protein‐1, resulting in release of TGF‐β1 215. This mechanism therefore could be a link between elastolysis induced by MMP‐9 and simultaneous production of fibrosis by activation of TGF‐β1 (fig. 3⇓). Thus, MMP‐12 is a prominent MMP in the mouse, and while present in humans does not appear to be as important as MMP‐9. Possible interrelationship between small airway fibrosis and emphysema in chronic obstructive pulmonary disease. Transforming growth factor (TGF)‐β activates matrix metalloproteinase‐9 (MMP‐9) and is in turn activated by MMP‐9. α1‐AT: α1‐antitrypsin. Normally proteases are counteracted by an excess of endogenous antiproteases. The major inhibitors of serine proteases are α1‐AT in lung parenchyma and airway epithelium-derived SLPI in the airways. Other serine protease inhibitors include elafin and α1‐antichymotrypsin. Serine protease inhibitors inactivate NE and other serine proteases such as proteinase‐3 216. Multiple genetic variants of α1‐AT are now recognised that give rise to reduced circulating active α1‐AT concentrations 217, 218. The best described deficiency that results in early onset emphysema is the ZZ type in which a single amino acid substitution (Gly342→Lys) results in structural alterations in α1‐AT resulting in failure of its normal post-translational modification and secretion by hepatocytes leading to very low plasma concentrations. Whether heterozygotes and other genetic variants that reduce circulating α1‐AT concentrations to a lesser extent than the ZZ phenotype also predispose to emphysema is more debatable 219. ZZ α1‐AT deficiency is a rare cause of emphysema accounting for <1% of patients, but it was proposed long ago that cigarette smoking may oxidise α1‐AT resulting in impaired antiprotease function and increased neutrophil elastase activity 220. The mechanism appears to be due to oxidative stress and oxidation of methionine at positions 351 or 358 impairs anti‐NE activity of α1‐AT 170. SLPI is the other major serine proteinase inhibitor in the airways 221. Like α1‐AT, SLPI may be inactivated by oxidative stress, but also by cleavage through its active site by cathepsins L and S 222 and in patients with emphysema proteolytic fragments of SLPI are found in BAL fluid which contributes to the reduced anti‐NE activity in these patients. This inactivation of SLPI not only impairs its anti‐NE activity, but also its antimicrobial and anti-inflammatory roles. SLPI downregulates LPS‐induced TNF‐α and MMP secretion from monocytes 223, 224 and this may be mediated by an inhibitory effect on IκBα degradation, resulting in inhibition of NF‐κB 225. The role of elafin and α1‐antichymotryptase in COPD are less well defined 226, 227. Four tissue inhibitors of MMPs (TIMP1‐4) counteract MMPs 228. TIMP‐1 secretion from alveolar macrophages isincreased in response to inflammatory stimuli, but the increase is blunted in cells derived from COPD patients, so favouring increased elastolysis 70, 71. An increased frequency of loss of function mutations of TIMP‐2 has been described in patients with COPD 229. What are the amplifying mechanisms? The inflammatory changes and protease imbalance in COPD are also seen in cigarette smokers without COPD but to a lesser extent 12, 47, 70, 81, 82, suggesting that the accelerated decline in lung function in COPD may be due to amplification of the normal pulmonary inflammatory response to irritants. This may be due to increased production of inflammatory mediators and enzymes, or because of defective endogenous anti-inflammatory or antiprotease mechanisms. These differences might be explained by polymorphisms in thegenes encoding cytokines, proteases, anti-inflammatory proteins and antiproteases 230, 231. Another hypothesis is that these differences are due to latent virus infection 232. The latent adenovirus sequence E1A is more commonly detected in the lungs of patients with emphysema than in matched smoking control subjects and is correlated with an increased inflammatory response 47. Adenovirus infection amplifies the inflammatory response to cigarette smoke in the airways of guinea pigs 68. Transfection of E1A into a human epithelial cell line results in increased activation of the transcription factor NF‐κB with consequent increased release of IL‐8 in response to cell activation and increased production of TGF‐β1, providing a molecular mechanism for the amplification in inflammatory response 233, 234. Another molecular mechanism that may underlie the amplification of inflammation in COPD may involve impaired activity of HDAC in alveolar macrophages. In macrophages from cigarette smokers there is impaired activity of HDAC, which is involved in switching off the transcription of inflammatory genes by reversing the acetylation of core histones that is associated with their activation 83, 84. In COPD patients there is even more marked reduction in HDAC activity in the peripheral lung than in smokers without airway obstruction 178. This may lead to amplification of the expression of inflammatory genes, as is seen in alveolar macrophages from patients with COPD 71, 82. There is also increased activation of NF‐κB in these cells from patients with COPD 73, 74. Although smoking is the major causal mechanism in COPD, quitting smoking does not appear to result in resolution of theinflammatory response in the airways, particularly in advanced disease 47, 235, 236. This suggests that there are perpetuating mechanisms that maintain the chronic inflammatory process once it has become established. This may account for presentation of COPD in patients who stopped smoking many years before their first symptoms develop. The mechanisms of disease persistence are currently unknown. Why is there a poor response to corticosteroids? Inhaled corticosteroids are now the mainstay of chronic asthma therapy and the recognition that chronic inflammation is also present in COPD provided a rationale for their use in COPD. Indeed, inhaled corticosteroids are now widely prescribed in the treatment of COPD and are used almost as frequently as in asthma. However, the inflammation in COPD is not suppressed even by high doses of inhaled or oral corticosteroids 80, 81, 237. This may reflect the fact that neutrophilic inflammation in humans is not suppressible by corticosteroids as neutrophil survival is prolonged by steroids 238, 239. Approximately 10% of patients with stable COPD show some symptomatic and objective improvement with oralcorticosteroids and it is likely that these patients have concomitant asthma, as both diseases are very common. Indeed, airway hyperresponsiveness, a characteristic of asthma, may predict the rate of decline in COPD 240. A response to corticosteroids is predicted by increased numbers of eosinophils in sputum and an increase in exhaled NO 105, 106, both characteristic features of asthma. Four large studies have shown that high doses of inhaled corticosteroids fail to reduce the progression of COPD 171–174. Inhaled corticosteroids may have a small effect in reducing exacerbations in patients with severe disease 241. It seems likely that there is an active resistance to corticosteroids in COPD. High doses of corticosteroids fail to reduce cytokine and chemokines that should be suppressed by corticosteroid treatment 80, 81. The molecular mechanisms of corticosteroid resistance are not yet known, but may be the same mechanisms that result in amplification of inflammatory responses. Thus a reduction in HDAC activity in macrophages 83 may prevent the anti-inflammatory action of corticosteroids, which is dependent on recruitment of HDACs to the inflammatory gene complex 84. Similarly latent adenovirus appears to induce corticosteroid resistance in experimental animals 242. By contrast, there is a beneficial effect of systemic corticosteroids in treating acute exacerbations of COPD, with improved clinical outcome and reduced length of hospital admission 243, 244. The reasons for this discrepancy between steroid responses in acute versus chronic COPD may relate to differences in the inflammatory response (increased eosinophils) or airway oedema in exacerbations. What are the mechanisms of acute exacerbations? Although acute exacerbations of COPD, defined by increased symptoms and worsening lung function, are a common cause of hospital admission, their cellular and molecular mechanisms are far from clear 245. Acute exacerbations may be prolonged and have a profound effect on the quality of life 246 and may accelerate the progression of COPD 247. It was always assumed that the increased amount and purulence of sputum signified bacterial infection of the respiratory tract, but it is now evident that many exacerbations in COPD (as in asthma) are also due to upper respiratory tract viral infections (particularly rhinovirus) and to environmental factors, such as air pollution and temperature 248, 249 There is an increase in neutrophils and concentrations of IL‐6, IL‐8, TNF‐α and LTB4 in sputum during an exacerbation 250, 251 and patients who have frequent exacerbations have higher levels of IL‐6 and lower concentrations of SLPI, even when COPD is stable 252, 253. There is also an increase in the activation of NF‐κB in alveolar macrophages during exacerbations of COPD, providing a link between infections, oxidative stress and the enhanced expression of inflammatory genes 74. Purulent exacerbations are associated with bacterial infection and are characterised by a marked increase in LTB4 concentrations in sputum 254. Chronic bacterial colonisation of sputum is correlated with increased inflammatory indices in sputum 98 and predisposes to more frequent purulent exacerbations 255. Bronchial biopsies show an increase in eosinophils during exacerbations in patients with mild chronic bronchitis 107 and this may reflect the marked upregulation of RANTES (regulated on activation, normal T‐cell expressed and secreted) seen in airway epithelial cells during acute exacerbations 39. However, there is no increase in sputum eosinophils during exacerbations in patients with severe COPD 252. An increase in markers of oxidative stress and exhaled NO, presumably reflecting increased airway inflammation, are observed during exacerbations 163, 166, 256, 257. This may reflect increased activation of NF‐κB during exacerbations 74. Thus exacerbations of COPD appear to be due to yet further amplification of the inflammatory process. This implies that treatments that suppress inflammation in COPD would also block exacerbations. The reason why the lower respiratory tract of some patients with COPD is colonised with bacteria, such as nontypeable strains of Haemophilus influenzae, Streptococcus pneumoniae and Moraxella catarrhalis is uncertain 258. In a recent study 24% of 600 sputum specimens taken during an acute exacerbation contained a bacterial pathogen compared to 18% inpatients without exacerbations 259. Approximately one third of exacerbations were associated with “new” strains of bacteria with a differing protein composition, suggesting newly-acquired infection rather than a flare-up of existing organisms. However these “new” strains might arise from antigenic variants of persistent colonising strains, which may make them less susceptible to local immune mechanisms 260. Persistence of certain bacteria in the lower respiratory tract of COPD patients may be due to localisation to protected sites. H. influenzae is localised to sites within the airway wall, such as between cells in the airway walls 261 and these organisms are not susceptible to antibiotics or antibody-mediated defence mechanisms when they are located between airway epithelial cells 262. H. influenzae infection is associated with increased concentrations of inflammatory mediators, including IL‐8 and TNF‐α, in COPD patients 263. The inflammatory process itself may also promote persistence of certain bacteria. For example, human neutrophil defensins may increase adhesion of H. influenzae to airway epithelial cells and may thus predispose to invasion 264. What are the next questions? The understanding of the cellular and molecular mechanisms involved in COPD is at an early stage compared withknowledge of asthma. Although both diseases involve inflammation in the respiratory tract, the pattern of inflammation, the results of the inflammatory process and the therapeutic response are markedly different. This review has focussed on some key questions that are now being addressed in COPD, although it is by no means comprehensive. Although activation of several inflammatory cells has now been identified in COPD, their relative importance and sequential role in producing the typical pathology of COPD are still poorly understood. However, it is likely that cigarette smoke and other irritants activate resident cells, including macrophages, epithelial cells and dendritic cells, which then signal the influx of other inflammatory cells, including neutrophils, monocytes and T‐lymphocytes from the circulation. These cells all release multiple mediators of inflammation, although the pattern of mediators differs from those found in asthma. The pathological process is predominantly located in the lung periphery with involvement of small airways and lung parenchyma. However, the relationship between inflammation and fibrosis in small airways and destruction of lung parenchyma and mucus hypersecretion are uncertain and there are differences in the preponderance of these mechanisms between patients and at different stages of the disease. There is a need for better techniques for studying small airway function. There appears to be an amplification of the inflammatory process between smokers who do not have airflow limitation and the minority of smokers with accelerated decline of lung function who develop COPD. The molecular basis for this amplification needs further investigation, but possible mechanisms relate to genetic differences in inflammatory, proteolytic or protective mechanisms or acquired latent viral infections. The mechanisms of amplification may also be linked to the relative steroid resistance found in COPD and a plausible link is deficiency in HDAC activation that both amplifies inflammatory gene expression and impairs the anti-inflammatory response to corticosteroids. Much further research is now needed to answer some of these key questions. However, availability of tissues from patients with chronic obstructive pulmonary disease and patients who have a similar cigarette smoke exposure without chronic obstructive pulmonary disease and the development of novel molecular and cellular techniques make it likely that rapid progress will be made. This will make it possible to predict which smokers will develop chronic obstructive pulmonary disease and may identify new targets for the development of novel therapies that suppress this chronic inflammatory process. Many new drugs for chronic obstructive pulmonary disease are already in development 265 and several are about to enter clinical trials. “COPD: the important questions” a meeting held in Malta in November 2002: Chairmen: P. Barnes (UK), R. Pauwels (Belgium) and S. Shapiro (USA); Participants: Canada: M.Cosio, J. Hogg; Denmark: J. Vestbo; Ireland: G. McElvaney; Italy: L. Fabbri , M. Luisetti; Malta: R. Ellul-Micalef; The Netherlands: L. van Alphen; Switzerland: L.Nicod; UK: P.Calverley, E. Chilvers, W. MacNee, N. Pride, W. Wedzicha; USA: H. Chapman, S.Kunkel, S. Rennard. Lopez AD, Murray CC. The global burden of disease, 1990–2020. Nat Med 1998;4:1241–1243. Barnes PJ. Chronic obstructive pulmonary disease. New Engl J Med 2000;343:269–280. Barnes PJ. New treatments for chronic obstructive pulmonary disease. Curr Opin Pharmacol 2001;1:217–222. Barnes PJ. New concepts in COPD. Ann Rev Med 2003;54:113–129. Gross CP, Anderson GF, Powe NR. The relation between funding by the National Institutes of Health and the burden of disease. N Engl J Med 1999;340:1881–1887. Saetta M, Turato G, Maestrelli P, Mapp CE, Fabbri LM. Cellular and structural bases of chronic obstructive pulmonary disease. Am J Respir Crit Care Med 2001;163:1304–1309. Di Stefano A, Capelli A, Lusuardi M, et al. Severity of airflow limitation is associated with severity of airway inflammation in smokers. Am J Respir Crit Care Med 1998;158:1277–1285. Pesci A, Balbi B, Majori M, et al. Inflammatory cells and mediators in bronchial lavage of patients with chronic obstructive pulmonary disease. Eur Respir J 1998;12:380–386. Keatings VM, Collins PD, Scott DM, Barnes PJ. Differences in interleukin‐8 and tumor necrosis factor‐a in induced sputum from patients with chronic obstructive pulmonary disease or asthma. Am J Respir Crit Care Med 1996;153:530–534. Fabbri L, Beghe B, Caramori G, Papi A, Saetta M. Similarities and discrepancies between exacerbations of asthma and chronic obstructive pulmonary disease. Thorax 1998;53:803–808. Hogg JC, Macklem PT, Thurlbeck WM. Site and nature ofairway obstruction in chronic obstructive lung disease. N Engl J Med 1968;278:1355–1360. Cosio M, Ghezzo H, Hogg JC, et al. The relations between structural changes in small airways and pulmonary-function tests. N Engl J Med 1978;298:1277–1281. Gelb AF, Hogg JC, Muller NL, et al. Contribution of emphysema and small airways in COPD. Chest 1996;109:353–359. Chu FSF, Utokaparch S, Butazu L, et al. The nature of airay obstruction in COPD. Am J Respir Crit Care Med 2003;167:A874. de Boer WI, van Schadewijk A, Sont JK, et al. Transforming growth factor beta1 and recruitment of macrophages and mast cells in airways in chronic obstructive pulmonary disease. Am J Respir Crit Care Med 1998;158:1951–1957. Takizawa H, Tanaka M, Takami K, et al. Increased expression of transforming growth factor-beta1 in small airway epithelium from tobacco smokers and patients with chronic obstructive pulmonary disease (COPD). Am J Respir Crit Care Med 2001;163:1476–1483. Ihn H. Pathogenesis of fibrosis: role of TGF‐b and CTGF. Curr Opin Rheumatol 2002;14:681–685. Chen G, Grotendorst G, Eichholtz T, Khalil N. GM‐CSF increases airway smooth muscle cell connective tissue expression by inducing TGF‐beta receptors. Am J Physiol Lung Cell Mol Physiol 2003;284:L548–L556. Macklem PT. The physiology of small airways. Am J Respir Crit Care Med 1998;157:S181–S183. Kim WD, Eidelman DH, Izquierdo JL, Ghezzo H, Saetta MP, Cosio MG. Centrilobular and panlobular emphysema in smokers. Two distinct morphologic and functional entities. Am Rev Respir Dis 1991;144:1385–1390. Hogg JC, Wright JL, Wiggs BR, Coxson HO, Opazo SA, Pare PD. Lung structure and function in cigarette smokers. Thorax 1994;49:473–478. Nakano Y, Muro S, Sakai H, et al. Computed tomographic measurements of airway dimensions and emphysema in smokers. Correlation with lung function. Am J Respir Crit Care Med 2000;162:1102–1108. Greaves IA, Colebatch HJ. Elastic behavior and structure ofnormal and emphysematous lungs post mortem. Am Rev Respir Dis 1980;121:127–136. Pare PD, Brooks LA, Bates J, et al. Exponential analysis of the lung pressure-volume curve as a predictor of pulmonary emphysema. Am Rev Respir Dis 1982;126:54–61. Pride NB, Milic-Emili J.. Lung MechanicsIn: Calverley PMA Macnee W Rennard S Pride NB editors. Chronic Obstructive Pulmonary DiseaseLondon, Arnold, 2003; (inpress). Van Brabandt H, Cauberghs M, Verbeken E, Moerman P, Lauweryns JM, Van de Woestijne KP. Partitioning of pulmonary impedance in excised human and canine lungs. J Appl Physiol 1983;55:1733–1742. Verbeken EK, Cauberghs M, Mertens I, Lauweryns JM, Van de Woestijne KP. Tissue and airway impedance of excised normal, senile, and emphysematous lungs. J Appl Physiol 1992;72:2343–2353. Yanai M, Sekizawa K, Ohrui T, Sasaki H, Takishima T. Site of airway obstruction in pulmonary disease: direct measurement of intrabronchial pressure. J Appl Physiol 1992;72:1016–1023. Peto R, Speizer FE, Cochrane AL, et al. The relevance in adults of air-flow obstruction, but not of mucus hypersecretion, to mortality from chronic lung disease. Results from 20years of prospective observation. Am Rev Respir Dis 1983;128:491–500. Vestbo J. Epidemiological studies in mucus hypersecretion. Novartis Found Symp 2002;248:3–12. Zhu J, Majumdar S, Qiu Y, et al. Interleukin‐4 and interleukin‐5 gene expression and inflammation in the mucus-secreting glands and subepithelial tissue of smokers with chronic bronchitis. Lack of relationship with CD8+ cells. Am J Respir Crit Care Med 2001;164:2220–2228. Sommerhoff CP, Nadel JA, Basbaum CB, Caughey GH. Neutrophil elastase and cathepsin G stimulate secretion from cultured bovine airway gland serous cells. J Clin Invest 1990;85:682–689. Sommerhoff CP, Caughey GH, Finkbeiner WE, Lazarus SC, Basbaum CB, Nadel JA. Mast cell chymase: a potent secretagogue for airway gland serous cells. J Immunol 1989;142:2450–2455. Witko-Sarsat V, Halbwachs-Mecarelli L, Schuster A, et al. Proteinase 3, a potent secretagogue in airways, is present in cystic fibrosis sputum. Am J Respir Cell Mol Biol 1999;20:729–736. Lange P, Nyboe J, Appleyard M, Jensen G, Schnohr P. Relation of ventilatory impairment and of chronic mucus hypersecretion to mortality from obstructive lung disease and from all causes. Thorax 1990;45:579–585. Prescott E, Lange P, Vestbo J. Chronic mucus hypersecretion in COPD and death from pulmonary infection. EurRespir J 1995;8:1333–1338. Vestbo J, Lange P. Can GOLD Stage 0 provide information of prognostic value in chronic obstructive pulmonary disease?. Am J Respir Crit Care Med 2002;166:329–332. Retamales I, Elliott WM, Meshi B, et al. Amplification of inflammation in emphysema and its association with latent adenoviral infection. Am J Respir Crit Care Med 2001;164:469–473. Lacoste JY, Bousquet J, Chanez P. Eosinophilic and neutrophilic inflammation in asthma, chronic bronchitis and chronic obstructive pulmonary disease. J Allergy Clin Immunol 1993;92:537–548. Finkelstein R, Fraser RS, Ghezzo H, Cosio MG. Alveolar inflammation and its relation to emphysema in smokers. AmJ Respir Crit Care Med 1995;152:1666–1672. Sparrow D, Glynn RJ, Cohen M, Weiss ST. The relationship of the peripheral leukocyte count and cigarette smoking to pulmonary function among adult men. Chest 1984;86:383–386. Stanescu D, Sanna A, Veriter C, et al. Airways obstruction, chronic expectoration and rapid decline in FEV1 in smokers are associated with increased levels of sputum neutrophils. Thorax 1996;51:267–271. Terashima T, Wiggs B, English D, Hogg JC, van Eeden SF. Phagocytosis of small carbon particles (PM10) by alveolar macrophages stimulates the release of polymorphonuclear leukocytes from bone marrow. Am J Respir Crit Care Med 1997;155:1441–1447. Macnee W, Wiggs B, Belzberg AS, Hogg JC. The effect of cigarette smoking on neutrophil kinetics in human lungs. NEngl J Med 1989;321:924–928. Keatings VM, Barnes PJ. Granulocyte activation markers in induced sputum: comparison between chronic obstructive pulmonary disease, asthma and normal subjects. Am J Respir Crit Care Med 1997;155:449–453. Peleman RA, Rytila PH, Kips JC, Joos GF, Pauwels RA. The cellular composition of induced sputum in chronic obstructive pulmonary disease. Eur Respir J 1999;13:839–843. Condliffe AM, Kitchen E, Chilvers ER. Neutrophil priming: pathophysiological consequences and underlying mechanisms. Clin Sci (Lond) 1998;94:461–471. Noguera A, Batle S, Miralles C, et al. Enhanced neutrophil response in chronic obstructive pulmonary disease. Thorax 2001;56:432–437. Traves SL, Culpitt S, Russell REK, Barnes PJ, Donnelly LE. Elevated levels of the chemokines GRO‐α and MCP‐1 in sputum samples from COPD patients. Thorax 2002;57:590–595. Tanino M, Betsuyaku T, Takeyabu K, et al. Increased levels of interleukin‐8 in BAL fluid from smokers susceptible to pulmonary emphysema. Thorax 2002;57:405–411. Bazzoni F, Cassatella MA, Rossi F, Ceska M, Dewald B, Baggiolini M. Phagocytosing neutrophils produce and release high amounts of the neutrophil-activating peptide 1/interleukin 8. J Exp Med 1991;173:771–774. Pettersen CA, Adler KB. Airways inflammation and COPD: epithelial-neutrophil interactions. Chest 2002;121:142S–150S. Shapiro SD. The macrophage in chronic obstructive pulmonary disease. Am J Respir Crit Care Med 1999;160:S29–S32. Barnes PJ. Current and future therapies for airway mucus hypersecretion. Novartis Found Symp 2002;248:237–249. Meshi B, Vitalis TZ, Ionescu D, et al. Emphysematous lungdestruction by cigarette smoke. The effects of latent adenoviral infection on the lung inflammatory response. Am J Respir Cell Mol Biol 2002;26:52–57. Punturieri A, Filippov S, Allen E, et al. Regulation of elastinolytic cysteine proteinase activity in normal and cathepsin K‐deficient human macrophages. J Exp Med 2000;192:789–800. Russell RE, Thorley A, Culpitt SV, et al. Alveolar macrophage-mediated elastolysis: roles of matrix metalloproteinases, cysteine, and serine proteases. Am J Physiol Lung Cell Mol Physiol 2002;283:L867–L873. Russell RE, Culpitt SV, DeMatos C, et al. Release and activity of matrix metalloproteinase‐9 and tissue inhibitor of metalloproteinase‐1 by alveolar macrophages from patients with chronic obstructive pulmonary disease. Am J Respir Cell Mol Biol 2002;26:602–609. Lim S, Roche N, Oliver BG, Mattos W, Barnes PJ, Fan CK. Balance of matrix metalloprotease‐9 and tissue inhibitor of metalloprotease‐1 from alveolar macrophages in cigarette smokers. regulation by interleukin‐10. Am J Respir Crit Care Med 2000;162:1355–1360. Di Stefano A, Caramori G, Capelli A, et al. Increased expression of NF‐κB in bronchial bioipsies from smokers and patients with COPD. Eur Respir J 2002;20:556–563. Caramori G, Romagnoli M, Casolari P, et al. Nuclear localisation of p65 in sputum macrophages but not in sputum neutrophils during COPD exacerbations. Thorax 2003;58:348–351. Capelli A, Di Stefano A, Gnemmi I, et al. Increased MCP‐1 and MIP‐1β in bronchoalveolar lavage fluid of chronic bronchitis. Eur Respir J 1999;14:160–165. de Boer WI, Sont JK, van Schadewijk A, Stolk J, van Krieken JH, Hiemstra PS. Monocyte chemoattractant protein 1,interleukin8, and chronic airways inflammation in COPD. J Pathol 2000;190:619–626. Traves SL, Smith SJ, Barnes PJ, Donnelly LE. Increased migration of monocytes from COPD patients towards GROα is not mediated by an increase in CXCR2 receptor expression. Am J Resp Crit Care Med 2003:A824. Saetta M, Mariani M, Panina-Bordignon P, et al. Increased expression of the chemokine receptor CXCR3 and its ligand CXCL10 in peripheral airways of smokers with chronic obstructive pulmonary disease. Am J Respir Crit Care Med 2002;165:1404–1409. Tomita K, Caramori G, Lim S, et al. Increased p21CIP1/WAF1 and B cell lymphoma leukemia‐xL expression and reduced apoptosis in alveolar macrophages from smokers. Am J Respir Crit Care Med 2002;166:724–731. Culpitt SV, Nightingale JA, Barnes PJ. Effect of high dose inhaled steroid on cells, cytokines and proteases in induced sputum in chronic obstructive pulmonary disease. Am J Respir Crit Care Med 1999;160:1635–1639. Culpitt SV, Rogers DF, Shah P, et al. Impaired inhibition by dexamethasone of cytokine release by alveolar macrophages from patients with chronic obstructive pulmonary disease. Am J Respir Crit Care Med 2003;167:24–31. Ito K, Lim S, Caramori G, Chung KF, Barnes PJ, Adcock IM. Cigarette smoking reduces histone deacetylase 2 expression, enhances cytokine expression and inhibits glucocorticoid actions in alveolar macrophages. FASEB J 2001;15:1100–1102. Ito K, Barnes PJ, Adcock IM. Glucocorticoid receptor recruitment of histone deacetylase 2 inhibits IL‐1b‐induced histone H4 acetylation on lysines 8 and 12. Mol Cell Biol 2000;20:6891–6903. Ito K, Lim S, Caramori G, et al. A molecular mechanism of action of theophylline: Induction of histone deacetylase activity to decrease inflammatory gene expression. Proc Natl Acad Sci USA 2002;99:8921–8926. Donnelly LE, Jones GE, Newton R, Barnes PJ. The anti-inflammatory action of resveratrol on human airway epithelial cells is not mediated via estrogen or glucocorticosteroid receptors. Am J Resp Crit Care Med 2003;165:A614. Fadok VA, Bratton DL, Rose DM, Pearson A, Ezekewitz RA, Henson PM. A receptor for phosphatidylserine-specific clearance of apoptotic cells. Nature 2000;405:85–90. Huynh ML, Fadok VA, Henson PM. Phosphatidylserine-dependent ingestion of apoptotic cells promotes TGF‐beta1 secretion and the resolution of inflammation. J Clin Invest 2002;109:41–50. Vandivier RW, Fadok VA, Hoffmann PR, et al. Elastase-mediated phosphatidylserine receptor cleavage impairs apoptotic cell clearance in cystic fibrosis and bronchiectasis. J Clin Invest 2002;109:661–670. Majo J, Ghezzo H, Cosio MG. Lymphocyte population and apoptosis in the lungs of smokers and their relation to emphysema. Eur Respir J 2001;17:946–953. Saetta M, Baraldo S, Corbino L, et al. CD8+ve cells in the lungs of smokers with chronic obstructive pulmonary disease. Am J Respir Crit Care Med 1999;160:711–717. Vukmanovic-Stejic M, Vyas B, Gorak-Stolinska P, Noble A, Kemeny DM. Human Tc1 and Tc2/Tc0 CD8 T‐cell clones display distinct cell surface and functional phenotypes. Blood 2000;95:231–240. Leckie MJ, Jenkins GR, Khan J, et al. Sputum T lymphocytes in asthma, COPD and healthy subjects have the phenotype of activated intraepithelial T cells (CD69+ CD103+). Thorax 2003;58:23–29. Kim WD, Kim WS, Koh Y, et al. Abnormal peripheral blood T‐lymphocyte subsets in a subgroup of patients with COPD. Chest 2002;122:437–444. Majori M, Corradi M, Caminati A, Cacciani G, Bertacco S, Pesci A. Predominant TH1 cytokine pattern in peripheral blood from subjects with chronic obstructive pulmonary disease. J Allergy Clin Immunol 1999;103:458–462. Hill AT, Campbell EJ, Hill SL, Bayley DL, Stockley RA. Association between airway bacterial load and markers of airway inflammation in patients with stable chronic bronchitis. Am J Med 2000;109:288–295. Cosio MG, Majo J, Cosio MG. Inflammation of the airways and lung parenchyma in COPD: role of T cells. Chest 2002;121:160S–165S. Prieto A, Reyes E, Bernstein ED, et al. Defective natural killer and phagocytic activities in chronic obstructive pulmonary disease are restored by glycophosphopeptical (inmunoferon). Am J Respir Crit Care Med 2001;163:1578–1583. Zeidel A, Beilin B, Yardeni I, Mayburd E, Smirnov G, Bessler H. Immune response in asymptomatic smokers. Acta Anaesthesiol Scand 2002;46:959–964. Hashimoto S, Kobayashi A, Kooguchi K, Kitamura Y, Onodera H, Nakajima H. Upregulation of two death pathways of perforin/granzyme and FasL/Fas in septic acute respiratory distress syndrome. Am J Respir Crit Care Med 2000;161:237–243. Takubo Y, Guerassimov A, Ghezzo H, et al. Alpha1-antitrypsin determines the pattern of emphysema and function in tobacco smoke-exposed mice: parallels with human disease. Am J Respir Crit Care Med 2002;166:1596–1603. Turato G, Zuin R, Saetta M. Pathogenesis and pathology of COPD. Respiration 2001;68:117–128. Papi A, Romagnoli M, Baraldo S, et al. Partial reversibility of airflow limitation and increased exhaled NO and sputum eosinophilia in chronic obstructive pulmonary disease. Am J Respir Crit Care Med 2000;162:1773–1777. Saetta M, Distefano A, Maestrelli P, et al. Airway eosinophilia in chronic bronchitis during exacerbations. Am J Resp Crit Care Med 1994;150:1646–1652. Saetta M, Di Stefano A, Maestrelli P, et al. Airway eosinophilia and expression of interleukin‐5 protein in asthma and in exacerbations of chronic bronchitis. Clin Exp Allergy 1996;26:766–774. Liu H, Lazarus SC, Caughey GH, Fahy JV. Neutrophil elastase and elastase-rich cystic fibrosis sputum degranulate human eosinophils in vitro. Am J Physiol 1999;276:L28–L34. Holt PG, Stumbles PA. Regulation of immunologic homeostasis in peripheral tissues by dendritic cells: the respiratory tract as a paradigm. J Allergy Clin Immunol 2000;105:421–429. Huang Q, Liu D, Majewski P, et al. The plasticity of dendritic cell responses to pathogens and their components. Science 2001;294:870–875. Francus T, Klein RF, Staiano-Coico L, Becker CG, Siskind GW. Effects of tobacco glycoprotein (TGP) on the immune system. II. TGP stimulates the proliferation of human T cells and the differentiation of human B cells into Ig secreting cells. J Immunol 1988;140:1823–1829. Zeid NA, Muller HK. Tobacco smoke induced lung granulomas and tumors: association with pulmonary Langerhans cells. Pathology 1995;27:247–254. Casolaro MA, Bernaudin JF, Saltini C, Ferrans VJ, Crystal RG. Accumulation of Langerhans' cells on the epithelial surface of the lower respiratory tract in normal subjects in association with cigarette smoking. Am Rev Respir Dis 1988;137:406–411. Tazi A, Soler P, Hance AJ. Adult pulmonary Langerhans' cell histiocytosis. Thorax 2000;55:405–416. Tazi A, Moreau J, Bergeron A, Dominique S, Hance AJ, Soler P. Evidence that Langerhans cells in adult pulmonary Langerhans cell histiocytosis are mature dendritic cells: importance of the cytokine microenvironment. J Immunol 1999;163:3511–3515. D'Hulst A, Vermeulen KY, Pauwels RA. Cigarette smoke exposure causes increase in pulmonary dendritic cells. AmJ Respir Crit Care Med 2002;164:A604. Mio T, Romberger DJ, Thompson AB, Robbins RA, Heires A, Rennard SI. Cigarette smoke induces interleukin‐8 release from human bronchial epithelial cells. Am J Respir Crit Care Med 1997;155:1770–1776. Hellermann GR, Nagy SB, Kong X, Lockey RF, Mohapatra SS. Mechanism of cigarette smoke condensate-induced acute inflammatory response in human bronchial epithelial cells. Respir Res 2002;3:22. Floreani AA, Wyatt TA, Stoner J, et al. Smoke and C5ainduce airway epithelial ICAM‐1 and cell adhesion. Am J Respir Cell Mol Biol 2003; (in press). Kasahara Y, Tuder RM, Taraseviciene-Stewart L, et al. Inhibition of VEGF receptors causes lung cell apoptosis and emphysema. J Clin Invest 2000;106:1311–1319. Adler KB, Li Y. Airway epithelium and mucus: intracellular signaling pathways for gene expression and secretion. Am J Respir Cell Mol Biol 2001;25:397–400. Aarbiou J, Rabe KF, Hiemstra PS. Role of defensins in inflammatory lung disease. Ann Med 2002;34:96–101. Pilette C, Ouadrhiri Y, Godding V, Vaerman JP, Sibille Y. Lung mucosal immunity: immunoglobulin‐A revisited. Eur Respir J 2001;18:571–588. Demoly P, Simony-Lafontaine J, Chanez P, et al. Cell proliferation in the bronchial mucosa of asthmatics and chronic bronchitics. Am J Respir Crit Care Med 1994;150:214–217. Franklin WA, Veve R, Hirsch FR, Helfrich BA, Bunn PA Jr. Epidermal growth factor receptor family in lung cancer and premalignancy. Semin Oncol 2002;29:3–14. Macnee W. Oxidative stress and lung inflammation in airways disease. Eur J Pharmacol 2001;429:195–207. Henricks PA, Nijkamp FP. Reactive oxygen species as mediators in asthma. Pulm Pharmacol Ther 2001;14:409–420. Beckman JS, Koppenol WH. Nitric oxide, superoxide, and peroxynitrite: the good, the bad, and the ugly. Am J Physiol 1996;271:C1432–C1437. Morrow JD. The isoprostanes: their quantification as an index of oxidant stress status in vivo. Drug Metab Rev 2000;32:377–385. Kawikova I, Barnes PJ, Takahashi T, Tadjkarimi S, Yacoub MH, Belvisi MG. 8‐epi-prostaglandin F2a, a novel non-cyclooxygenase derived prostaglandin, is a potent constrictor of guinea-pig and human airways. Am J Respir Crit Care Med 1996;153:590–596. Okazawa A, Kawikova I, Cui ZH, Skoogh BE, Lotvall J. 8‐Epi‐PGF2alpha induces airflow obstruction and airway plasma exudation in vivo. Am J Respir Crit Care Med 1997;155:436–441. van der Vliet A, Eiserich JP, Shigenaga MK, Cross CE. Reactive nitrogen species and tyrosine nitration in the respiratory tract: epiphenomena or a pathobiologic mechanism of disease?. Am J Respir Crit Care Med 1999;160:1–9. Gaut JP, Byun J, Tran HD, et al. Myeloperoxidase produces nitrating oxidants in vivo. J Clin Invest 2002;109:1311–1319. Cantin AM, Fells GA, Hubbard RC, Crystal RG. Antioxidant macromolecules in the epithelial lining fluid of the normal human lower respiratory tract. J Clin Invest 1990;86:962–971. Choi AM, Alam J. Heme oxygenase‐1: function, regulation, and implication of a novel stress-inducible protein in oxidant-induced lung injury. Am J Respir Cell Mol Biol 1996;15:9–19. Lim S, Groneberg D, Fischer A, et al. Expression of heme oxygenase isoenzymes 1 and 2 in normal and asthmatic airways. Effect of inhaled corticosteroids. Am J Respir Crit Care Med 2000;162:1912–1918. Comhair SA, Erzurum SC. Antioxidant responses to oxidant-mediated lung diseases. Am J Physiol Lung Cell Mol Physiol 2002;283:L246–L255. Avissar N, Finkelstein JN, Horowitz S, et al. Extracellular glutathione peroxidase in human lung epithelial lining fluid and in lung cells. Am J Physiol 1996;270:L173–L182. Bowler RP, Crapo JD. Oxidative stress in airways: is there a role for extracellular superoxide dismutase?. Am J Respir Crit Care Med 2002;166:S38–S43. Barnes PJ, Karin M. Nuclear factor‐κB: a pivotal transcription factor in chronic inflammatory diseases. New Engl J Med 1997;336:1066–1071. Janssen-Heininger YM, Poynter ME, Baeuerle PA. Recent advances towards understanding redox mechanisms in the activation of nuclear factor κB. Free Radic Biol Med 2000;28:1317–1327. Adcock IM, Brown CR, Kwon OJ, Barnes PJ. Oxidative stress induces NF‐κB DNA binding and inducible NOS mRNA in human epithelial cells. Biochem Biophys Res Commun 1994;199:1518–1524. Rusznak C, Devalia JL, Sapsford RJ, Davies RJ. Ozone-induced mediator release from human bronchial epithelial cells in vitro and the influence of nedocromil sodium. Eur Respir J 1996;9:2298–2305. Tomita K, Barnes PJ, Adcock IM. The effect of oxidative stress on histone acetylation and IL‐8 release. Biochem Biophys Res Comm 2003;301:572–577. Rahman I. Oxidative stress, chromatin remodeling and gene transcription in inflammation and chronic lung diseases. J Biochem Mol Biol 2003;36:95–109. Xanthoudakis S, Curran T. Redox regulation of AP‐1: a link between transcription factor signaling and DNA repair. Adv Exp Med Biol 1996;387:69–75. Devalia JL, Bayram H, Rusznak C, et al. Mechanisms of pollution-induced airway disease: in vitro studies in the upper and lower airways. Allergy 1997;52:45–5. ; 57–58. Ogura M, Kitamura M. Oxidant stress incites spreading of macrophages via extracellular signal-regulated kinases and p38 mitogen-activated protein kinase. J Immunol 1998;161:3569–3574. Forman HJ, Torres M. Reactive oxygen species and cell signaling: respiratory burst in macrophage signaling. Am J Respir Crit Care Med 2002;166:S4–S8. Pryor WA, Stone K. Oxidants in cigarette smoke. Radicals, hydrogen peroxide, peroxynitrate, and peroxynitrite. Ann N Y Acad Sci 1993;686:12–27. Britton JR, Pavord ID, Richards KA, et al. Dietary antioxidant vitamin intake and lung function in the general population. Am J Respir Crit Care Med 1995;151:1383–1387. Schunemann HJ, Freudenheim JL, Grant BJ. Epidemiologic evidence linking antioxidant vitamins to pulmonary function and airway obstruction. Epidemiol Rev 2001;23:248–267. Kharitonov SA, Barnes PJ. Exhaled markers of pulmonary disease. Am J Respir Crit Care Med 2001;163:1693–1772. Montuschi P, Barnes PJ. Analysis of exhaled breath condensate for monitoring airway inflammation. Trends Pharmacol Sci 2002;23:232–237. Paredi P, Kharitonov SA, Barnes PJ. Analysis of expired air for oxidation products. Am J Respir Crit Care Med 2002;166:S31–S37. Dekhuijzen PNR, Aben KHH, Dekker I, et al. Increased exhalation of hydrogen peroxide in patients with stable and unstable chronic obstructive pulmonary disease. Am J Respir Crit Care Med 1996;154:813–816. Nowak D, Kasielski M, Antczak A, Pietras T, Bialasiewicz P. Increased content of thiobarbituric acid-reactive substances and hydrogen peroxide in the expired breath condensate of patients with stable chronic obstructive pulmonary disease: no significant effect of cigarette smoking. Respir Med 1999;93:389–396. Biernacki WA, Kharitonov SA, Barnes PJ. Increased leukotriene B4 and 8‐isoprostane in exhaled breath condensate of patients with exacerbations of COPD. Thorax 2003;58:294–298. Pratico D, Basili S, Vieri M, Cordova C, Violi F, Fitzgerald GA. Chronic obstructive pulmonary disease is associated with an increase in urinary levels of isoprostane F2a‐III, an index of oxidant stress. Am J Respir Crit Care Med 1998;158:1709–1714. Rahman I, van Schadewijk AA, Crowther AJ, et al. 4‐Hydroxy‐2‐nonenal, a specific lipid peroxidation product, is elevated in lungs of patients with chronic obstructive pulmonary disease. Am J Respir Crit Care Med 2002;166:490–495. Taggart C, Cervantes-Laurean D, Kim G, et al. Oxidation of either methionine 351 or methionine 358 in α1‐antitrypsin causes loss of anti-neutrophil elastase activity. J Biol Chem 2000;275:27258–27265. Pauwels RA, Lofdahl CG, Laitinen LA, et al. Long-term treatment with inhaled budesonide in persons with mild chronic obstructive pulmonary disease who continue smoking. N Engl J Med 1999;340:1948–1953. Burge PS, Calverley PMA, Jones PW, Spencer S, Anderson JA, Maslen T. Randomised, double-blind, placebo-controlled study of fluticasone propionate in patients with moderate to severe chronic obstructive pulmonary disease; the ISOLDE trial. Br Med J 2000;320:1297–1303. Lung Health Study Research Group. Effect of inhaled triamcinolone on the decline in pulmonary function in chronic obstructive pulmonary disease. New Engl J Med 2000;343:1902–1909. Hutchison KA, Matic G, Meshinchi S, Bresnick EH, Pratt WB. Redox manipulation of DNA binding activity and BuGR epitope reactivity of the glucocorticoid receptor. J Biol Chem 1991;266:10505–10509. Barnes PJ, Adcock IM. How corticosteroid switch off inflammation in asthma. Ann Int Med 2003; (in press). Ito K, Watanabe S, Kharitonov S, Hanazawa T, Adcock IM, Barnes PJ. Histone deacetylase activity and gene expression in COPD patients. Eur Respir J 2001;18:316S. Gotoh Y, Cooper JA. Reactive oxygen species- and dimerization-induced activation of apoptosis signal-regulating kinase 1 in tumor necrosis factor‐a signal transduction. J Biol Chem 1998;273:17477–17482. Gottlieb DJ, Stone PJ, Sparrow D, et al. Urinary desmosine excretion in smokers with and without rapid decline of lung function: the Normative Aging Study. Am J Respir Crit Care Med 1996;154:1290–1295. Stockley RA. Proteases and antiproteases. Novartis Found Symp 2001;234:189–199. Senior RM, Tegner H, Kuhn C, Ohlsson K, Starcher BC, Pierce JA. The induction of pulmonary emphysema with human leukocyte elastase. Am Rev Respir Dis 1977;116:469–475. Damiano VV, Tsang A, Kucich U, et al. Immunolocalization of elastase in human emphysematous lungs. J Clin Invest 1986;78:482–493. Owen CA, Campbell MA, Boukedes SS, Campbell EJ. Cytokines regulate membrane-bound leukocyte elastase on neutrophils: a novel mechanism for effector activity. Am J Physiol 1997;272:L385–L393. Takeyama K, Agusti C, Ueki I, Lausier J, Cardell LO, Nadel JA. Neutrophil-dependent goblet cell degranulation: role ofmembrane-bound elastase and adhesion molecules. Am J Physiol 1998;275:L294–L302. Fischer BM, Voynow JA. Neutrophil elastase induces MUC5AC gene expression in airway epithelium via a pathway involving reactive oxygen species. Am J Respir Cell Mol Biol 2002;26:447–452. Nakamura H, Yoshimura K, McElvaney NG, Crystal RG. Neutrophil elastase in respiratory epithelial lining fluid of individuals with cystic fibrosis induces interleukin‐8 gene expression in a human bronchial epithelial cell line. J Clin Invest 1992;89:1478–1484. Le Barillec K, Si‐Tahar M, Balloy V, Chignard M. Proteolysis of monocyte CD14 by human leukocyte elastase inhibits lipopolysaccharide-mediated cell activation. J Clin Invest 1999;103:1039–1046. Belaaouaj A, McCarthy R, Baumann M, et al. Mice lacking neutrophil elastase reveal impaired host defense against gram negative bacterial sepsis. Nat Med 1998;4:615–618. Shapiro SD. Neutrophil elastase: path clearer, pathogen killer, or just pathologic?. Am J Respir Cell Mol Biol 2002;26:266–268. Ohbayashi H. Neutrophil elastase inhibitors as treatment for COPD. Expert Opin Investig Drugs 2002;11:965–980. Wright JL, Farmer SG, Churg A. Synthetic serine elastase inhibitor reduces cigarette smoke-induced emphysema in guinea pigs. Am J Respir Crit Care Med 2002;166:954–960. Luisetti M, Sturani C, Sella D, et al. MR889, a neutrophil elastase inhibitor, in patients with chronic obstructive pulmonary disease: a double-blind, randomized, placebo-controlled clinical trial. Eur Respir J 1996;9:1482–1486. Gorrini M, Lupi A, Viglio S, et al. Inhibition of human neutrophil elastase by erythromycin and flurythromycin, two macrolide antibiotics. Am J Respir Cell Mol Biol 2001;25:492–499. Goswami SK, Kivity S, Marom Z. Erythromycin inhibits respiratory glycoconjugate secretion from human airways in vitro. Am Rev Respir Dis 1990;141:72–78. Campbell EJ, Campbell MA, Owen CA. Bioactive proteinase 3 on the cell surface of human neutrophils: quantification, catalytic activity, and susceptibility to inhibition. J Immunol 2000;165:3366–3374. Duranton J, Bieth JG. Inhibition of proteinase 3 by α1‐antitrypsin in vitro predicts very fast inhibition in vivo. Am J Respir Cell Mol Biol 2003;29:57–61. Turk V, Turk B, Turk D. Lysosomal cysteine proteases: facts and opportunities. EMBO J 2001;20:4629–4633. Chapman HA, Riese RJ, Shi GP. Emerging roles for cysteine proteases in human biology. Annu Rev Physiol 1997;59:63–88. Wang Z, Zheng T, Zhu Z, et al. Interferon gamma induction of pulmonary emphysema in the adult murine lung. J Exp Med 2000;192:1587–1600. Zheng T, Zhu Z, Wang Z, et al. Inducible targeting of IL‐13 to the adult lung causes matrix metalloproteinase- and cathepsin-dependent emphysema. J Clin Invest 2000;106:1081–1093. Reddy VY, Zhang QY, Weiss SJ. Pericellular mobilization of the tissue-destructive cysteine proteinases, cathepsins B, L, and S, by human monocyte-derived macrophages. Proc Natl Acad Sci USA 1995;92:3849–3853. Linnevers C, Smeekens SP, Bromme D. Human cathepsin W, a putative cysteine protease predominantly expressed in CD8+ T‐lymphocytes. FEBS Lett 1997;405:253–259. Takeyabu K, Betsuyaku T, Nishimura M, et al. Cysteine proteinases and cystatin C in bronchoalveolar lavage fluid from subjects with subclinical emphysema. Eur Respir J 1998;12:1033–1039. Shapiro SD, Senior RM. Matrix metalloproteinases. Matrix degradation and more. Am J Respir Cell Mol Biol 1999;20:1100–1102. Finlay GA, O'Driscoll LR, Russell KJ, et al. Matrix metalloproteinase expression and production by alveolar macrophages in emphysema. Am J Respir Crit Care Med 1997;156:240–247. Betsuyaku T, Nishimura M, Takeyabu K, et al. Neutrophil granule proteins in bronchoalveolar lavage fluid from subjects with subclinical emphysema. Am J Respir Crit Care Med 1999;159:1985–1991. Ohnishi K, Takagi M, Kurokawa Y, Satomi S, Konttinen YT. Matrix metalloproteinase-mediated extracellular matrix protein degradation in human pulmonary emphysema. Lab Invest 1998;78:1077–1087. Imai K, Dalal SS, Chen ES, et al. Human collagenase (matrix metalloproteinase‐1) expression in the lungs of patients with emphysema. Am J Respir Crit Care Med 2001;163:786–791. Hautamaki RD, Kobayashi DK, Senior RM, Shapiro SD. Requirement for macrophage metalloelastase for cigarette smoke-induced emphysema in mice. Science 1997;277:2002–2004. Morris DG, Huang X, Kaminski N, et al. Loss of integrin avb6‐mediated TGF‐b activation causes MMP12‐dependent emphysema. Nature 2003;422:169–173. Lanone S, Zheng T, Zhu Z, et al. Overlapping and enzyme-specific contributions of matrix metalloproteinases‐9 and ‐12 in IL‐13‐induced inflammation and remodeling. J Clin Invest 2002;110:463–474. Yu Q, Stamenkovic I. Cell surface-localized matrix metalloproteinase‐9 proteolytically activates TGF‐beta and promotes tumor invasion and angiogenesis. Genes Dev 2000;14:163–176. Dallas SL, Rosser JL, Mundy GR, Bonewald LF. Proteolysis of latent transforming growth factor‐β (TGF‐β)‐binding protein‐1 by osteoclasts. A cellular mechanism for release of TGF‐b from bone matrix. J Biol Chem 2002;277:21352–21360. Rooney CP, Taggart C, Coakley R, McElvaney NG, O'Neill SJ. Anti-proteinase 3 antibody activation of neutrophils can be inhibited by α1‐antitrypsin. Am J Respir Cell Mol Biol 2001;24:747–754. Mahadeva R, Lomas DA. Genetics and respiratory disease. 2. Alpha 1‐antitrypsin deficiency, cirrhosis and emphysema. Thorax 1998;53:501–505. Carrell RW, Lomas DA. α1‐antitrypsin deficiency - a model for conformational diseases. N Engl J Med 2002;346:45–53. Lomas DA, Mahadeva R. α1‐antitrypsin polymerization and the serpinopathies: pathobiology and prospects for therapy. J Clin Invest 2002;110:1585–1590. Carp H, Janoff A. Possible mechanisms of emphysema in smokers. In vitro suppression of serum elastase-inhibitory capacity by fresh cigarette smoke and its prevention by antioxidants. Am Rev Respir Dis 1978;118:617–621. Vogelmeier C, Hubbard RC, Fells GA, et al. Anti-neutrophil elastase defense of the normal human respiratory epithelial surface provided by the secretory leukoprotease inhibitor. J Clin Invest 1991;87:482–488. Taggart CC, Lowe GJ, Greene CM, et al. Cathepsin B, L, and S cleave and inactivate secretory leucoprotease inhibitor. J Biol Chem 2001;276:33345–33352. Jin FY, Nathan C, Radzioch D, Ding A. Secretory leukocyte protease inhibitor: a macrophage product induced by and antagonistic to bacterial lipopolysaccharide. Cell 1997;88:417–426. Zhang Y, DeWitt DL, McNeely TB, Wahl SM, Wahl LM. Secretory leukocyte protease inhibitor suppresses the production of monocyte prostaglandin H synthase‐2, prostaglandin E2 and matrix metalloproteinases. J Clin Invest 1997;99:894–900. Taggart CC, Greene CM, McElvaney NG, O'Neill S. Secretory leucoprotease inhibitor prevents lipopolysaccharide-induced IκBα degradation without affecting phosphorylation or ubiquitination. J Biol Chem 2002;277:33648–33653. Sallenave JM. The role of secretory leukocyte proteinase inhibitor and elafin (elastase-specific inhibitor/skin-derived antileukoprotease) as alarm antiproteinases in inflammatory lung disease. Respir Res 2000;1:87–92. Ishii T, Matsuse T, Teramoto S, et al. Association between a1‐antichymotrypsin polymorphism and susceptibility to chronic obstructive pulmonary disease. Eur J Clin Invest 2000;30:543–548. Cawston T, Carrere S, Catterall J, et al. Matrix metalloproteinases and TIMPs: properties and implications for the treatment of chronic obstructive pulmonary disease. Novartis Found Symp 2001;234:205–218. Hirano K, Sakamoto T, Uchida Y, et al. Tissue inhibitor ofmetalloproteinases‐2 gene polymorphisms in chronic obstructive pulmonary disease. Eur Respir J 2001;18:748–752. Barnes PJ. Molecular genetics of chronic obstructive pulmonary disease. Thorax 1999;54:245–252. Hogg JC. Role of latent viral infections in chronic obstructive pulmonary disease and asthma. Am J Respir Crit Care Med 2001;164:S71–S75. Gilmour PS, Rahman I, Hayashi S, Hogg JC, Donaldson K, Macnee W. Adenoviral E1A primes alveolar epithelial cells to PM(10)‐induced transcription of interleukin‐8. Am J Physiol Lung Cell Mol Physiol 2001;281:L598–L606. Higashimoto Y, Elliott WM, Behzad AR, et al. Inflammatory mediator mRNA expression by adenovirus E1A‐transfected bronchial epithelial cells. Am J Respir Crit Care Med 2002;166:200–207. Loppow D, Schleiss MB, Kanniess F, Taube C, Jorres RA, Magnussen H. In patients with chronic bronchitis a four week trial with inhaled steroids does not attenuate airway inflammation. Respir Med 2001;95:115–121. Meagher LC, Cousin JM, Seckl JR, Haslett C. Opposing effects of glucocorticoids on the rate of apoptosis in neutrophilic and eosinophilic granulocytes. J Immunol 1996;156:4422–4428. Nightingale JA, Rogers DF, Chung KF, Barnes PJ. No effect of inhaled budesonide on the response to inhaled ozone in normal subjects. Am J Respir Crit Care Med 2000;161:479–486. Tashkin DP, Altose MD, Connett JE, Kanner RE, Lee WW, Wise RA. Methacholine reactivity predicts changes in lung function over time in smokers with early chronic obstructive pulmonary disease. The Lung Health Study Research Group. Am J Respir Crit Care Med 1996;153:1802–1811. Paggiaro PL, Dahle R, Bakran I, Frith L, Hollingworth K, Efthimou J. Multicentre randomised placebo-controlled trial of inhaled fluticasone propionate in patients with chronic obstructive pulmonary disease. Lancet 1998;351:773–780. Yamada K, Elliott WM, Brattsand R, Valeur A, Hogg JC, Hayashi S. Molecular mechanisms of decreased steroid responsiveness induced by latent adenoviral infection in allergic lung inflammation. J Allergy Clin Immunol 2002;109:35–42. Niewoehner DE, Erbland ML, Deupree RH, et al. Effect ofsystemic glucocorticoids on exacerbations of chronic obstructive pulmonary disease. N Engl J Med 1999;340:1941–1947. Davies L, Angus RM, Calverley PM. Oral corticosteroids in patients admitted to hospital with exacerbations of chronic obstructive pulmonary disease: a prospective randomised controlled trial. Lancet 1999;354:456–460. Wedzicha JA. Exacerbations: etiology and pathophysiologic mechanisms. Chest 2002;121:136S–141S. Seemungal TA, Donaldson GC, Paul EA, Bestall JC, Jeffries DJ, Wedzicha JA. Effect of exacerbation on quality of life inpatients with chronic obstructive pulmonary disease. AmJ Respir Crit Care Med 1998;157:1418–1422. Seemungal T, Harper-Owen R, Bhowmik A, et al. Respiratory viruses, symptoms, and inflammatory markers inacute exacerbations and stable chronic obstructive pulmonary disease. Am J Respir Crit Care Med 2001;164:1618–1623. Donaldson GC, Seemungal T, Jeffries DJ, Wedzicha JA. Effect of temperature on lung function and symptoms in chronic obstructive pulmonary disease. Eur Respir J 1999;13:844–849. Crooks SW, Bayley DL, Hill SL, Stockley RA. Bronchial inflammation in acute bacterial exacerbations of chronic bronchitis: the role of leukotriene B4. Eur Respir J 2000;15:274–280. Aaron SD, Angel JB, Lunau M, et al. Granulocyte inflammatory markers and airway infection during acute exacerbation of chronic obstructive pulmonary disease. AmJ Respir Crit Care Med 2001;163:349–355. Patel IS, Seemungal TA, Wilks M, Lloyd-Owen SJ, Donaldson GC, Wedzicha JA. Relationship between bacterial colonisation and the frequency, character, and severity of COPD exacerbations. Thorax 2002;57:759–764. Agusti AG, Villaverde JM, Togores B, Bosch M. Serial measurements of exhaled nitric oxide during exacerbations of chronic obstructive pulmonary disease. Eur Respir J 1999;14:523–528. Sethi S, Murphy TF. Bacterial infection in chronic obstructive pulmonary disease in 2000: a state-of-the-art review. Clin Microbiol Rev 2001;14:336–363. Sethi S, Evans N, Grant BJ, Murphy TF. New strains of bacteria and exacerbations of chronic obstructive pulmonary disease. N Engl J Med 2002;347:465–471. van Alphen L, Jansen HM, Dankert J. Virulence factors in the colonization and persistence of bacteria in the airways. Am J Respir Crit Care Med 1995;151:2094–2099. Moller LV, Timens W, van der BW, et al. Haemophilus influenzae in lung explants of patients with end-stage pulmonary disease. Am J Respir Crit Care Med 1998;157:950–956. van Schilfgaarde M, Eijk P, Regelink A, et al. Haemophilus influenzae localized in epithelial cell layers is shielded from antibiotics and antibody-mediated bactericidal activity. Microb Pathog 1999;26:249–262. Bresser P, Out TA, van Alphen L, Jansen HM, Lutter R. Airway inflammation in nonobstructive and obstructive chronic bronchitis with chronic Haemophilus influenzae airway infection. Comparison with noninfected patients with chronic obstructive pulmonary disease. Am J Respir Crit Care Med 2000;162:947–952. Gorter AD, Eijk PP, van Wetering S, Hiemstra PS, Dankert J, van Alphen L. Stimulation of the adherence of Haemophilus influenzae to human lung epithelial cells by antimicrobial neutrophil defensins. J Infect Dis 1998;178:1067–1074. Barnes PJ. New treatments for COPD. Nature Rev Drug Disc 2002;1:437–445.